Week 6 was one of the longest weeks of my life and it will most likely take multiple posts to cover it. Often when people refer to something as the longest of their life it is in a negative aspect, but this one was a whole mix of adventure that just makes me smile when I look back on it. Our German church family at our Valentine’s Day Dinner. We started off the week with church, of course. We went early so that I could drop off thefamily and drive over to the children’s hospital to see my friend Marina and Baby Ben whose finger had been crushed. Visitors were not allowed up to this point and I wanted to try and be an encouragement to her. This, I might add,was the first time I had driven in downtown Mannheim. Often Mannheim is described as an easy city to get around because of how it is sectioned off into blocks. However, this isn’t the case with the entire city, only the very central part. Of course the hospital was on the outskirts of this area where the roads literally go in all directions and diagonals. A little background on me, I’m not one of those useful minister’s wives who can sing or play piano. However, I have always been an asset to my husband’s ministry in that I’m pretty good with directions and navigating. We’ve been to numerous large cities, NewYork, Chicago, Oklahoma City, Los Angeles etc. The only one, up to this point where I have gotten totally turned around is Houston, which is awful! Now I can add another – Mannheim. I am so thankful for GPS systems in newer cars! Seriously, I couldn’t have done Europe 20 years ago people! So, here I was trying to listen to this GPS tell me where to go when I noticed a car to my right and a motorcycle who are both motioning to me like I’m crazy. Then it dawned on me, I was totally in the wrong lane where oncoming traffic would be approaching any second. Funny thing was, neither the car nor the motorcyclist would move to let me over – go figure! When I finally got myself settled in the right lane, I made it to the hospital parking lot. As I pulled in the guard in the booth, who spoke impeccable English, asked what business I had there. I let him know I was there to visit a friend and their child. He frankly told me that I was in the wrong parking lot and that it was only for people bringing their own children into the hospital. I promptly apologized and asked for directions to the proper lot. Instead. he found it easier to let me know that he would let me in, but that I’d better read the signs well or else I would be charged 200 euro! He informed me that not knowing German would not help me in the matter and just not to be stupid in my parking (his actual words!) So, with some trepidations I drove on down into the parking lot and found a spot that didn’t seem to have any ominous signs around it and went in for a visit. Baby Ben was in very good spirits and getting along so well even though his little hand was all bound up! Truly, he is such a happy contagious little fella. Marina seemed to be doing well too, as much as a momma can who has been stuck in the hospital with her little one for days. We had a great visit and I returned to the church only 20 minutes late – a success under thecircumstances. That night after service we had our monthly pizza fellowship where my friend Asha, who is a British young woman working as a nanny in Germany, made me some actual British scones! I make scones for Lynn’s Sunday School class back home in the states, so it was fun to try an authentic recipe, which was outstanding and yes – I gotthe recipe! She was so pleased that I put the jam on first and then the cream as I guess this order of toppings is debated throughout the UK from village to village. Thank you, Asha! Our big plan for the week started on Tuesday. We really wanted to fit in a trip to Italy while we were in Europe. This was a little bit complicated as we had a Bible Study every Tuesday night which kind of breaks up the week and the time for travel. However, we were undaunted by this challenge and came up with a masterplan to work around our limitations. One thing Americans think of when they think of Europe is rail travel. In theory it sounds like an easy and obvious way to travel. However, it is a littlebit puzzle-like to fit the plans together. For instance we hear of night trains that will whisk you off to your destination while you sleep! Sounds great in theory, but the problem is getting to the night train. Our closest one that went to Italy was in Munich. The problem was that we couldn’t get to Munich in time to catch that train. So, instead we had to piece together an overnight trip that turned into a grand adventure. Another, weird thing about rail travel is that they sell you on rail passes, but that doesn’t necessarily get you everywhere you want to go. More than likely any large trip you take will entail purchasing reservations on the trains you want to catch. So after piecing together your route, you then have to add together all the reservation costs. It takes hours in the planning for a family our size, and I never did find where anyone would help. This would be a great job – being a train travel puzzle solver. Midnight at the train station – Before the adventure began. Our original grand plan was to get home from Bible study about 8:45-9:00, sleep for a couple of hours then head to the train station to catch our first train at midnight. This first train really only took us right back up to the Mannheim train station, but we wanted to park the car for free and where someone could watch it for us. Lynn is discipling a man every week who can’t get out because of health conditions. His apartment looks right over the parking area where we left the car, so that worked out nicely. Anyway, our train from Mannheim didn’t actually leave until 3:30 in the morning (I know!Crazy right!?) So we planned to just hang out in the terminal area until then. Here’s where the adventure started to unhinge. When we arrived in Mannheim, we were greeted with the realization that they actually close the inside of the building from midnight until 4:30am! We were faced with having to wait for 3 hours outside in the freezing cold! We tried to huddle up against the doorway out of the wind where an elderly couple were doing the same thing. It didn’t help – at all. After a few minutes of this we got on our phones looking for an all-night coffee shop or something that might beopen. No coffee shops were open unfortunately. I told Lynn that maybe we could just go to a hotel and sit in their lobby for a little while. He eventually went up and around to the street view and the elderly man followed. A few extremely long minutes later he reappeared and said that there was a doner (shawarma type place) open across the street from the train station and maybe we could go over there and buy some food and sit a bit. This seemed like a good plan so off we went wheeling our luggage behind us. Mannheim Train Station – in the day when it’s open! Immediately when we walked in, I knew this was not going to be a good experience. The place was crowded with people, smoke, and a whole sketchy atmosphere. A couple of things to note here: 1. It was the week of Fasching,which is like Mardi Gras in New Orleans. It’s a carnival time of partying the week before Ash Wednesday for the Catholics. Most of the country celebrates this time with raucous parties and dressing up in costumes, similar to what people do at Halloween time in America. 2. Germany doesn’t have the same kind of anti-smoking-in-public-places laws that the U.S. has. So there we sat in the smoke-filled room with people in costumes coming and going. It was quite the education for our family in social anthropology as we watched people like Pirate man with his two devil ladies on his arms coming in to get a late night/morning snack. Lynn ordered a couple of doners, but we weren’t exactly hungry, and the atmosphere was killing the appetite as well. I noticed the elderly couple did the same as us, but only stayed about a half an hour before leaving. I’m not sure where they went or maybe they had an earlier train than us. I saw a single young woman come in wheeling her luggage behind and my first thought was “wow, that seems kind of dangerous for her to be out in the middle of the night with luggage by herself. She must be a student and/or avid traveler.”I couldn’t help but overhear her talking on her phone in English – she was American. After finishing her middle of the night meal she retreated into the bathroom which was only inches from my chair where it sounded like she was sick. On my left were a couple of men who were playing on the slot machines. They were there for the entirety of the night/morning while we were there. We didn’t see any of them win anything, but the coins kept going in as the cigarettes kept getting lit. Then walked in a blond girl with a funky haircut and leather jacket. She reminded me of some kind of 80s punk star or something and she was twitching like crazy as she ate her doner. I’m pretty sure it was a tweaking kind of twitch from drugs. It definitely wasn’t normal and as she finished, I noticed her reach into her purse and grab a pill from a folded-up piece of foil and pop it in. Pretty soon one of the slot machine men noticed her and bought her a drink and well, let’s say they left for awhile. Meanwhile, the young woman in the bathroom was concerning me as she had been in there for over 30 minutes. I was thinking all kinds of mom thoughts,like was she ill? Was she doing drugs? Did I hear crying? Did someone follow her in there? Is she even alive? I was about to go investigate like Angela Lansbury from “Murder She Wrote”, when I finally saw her come out of the bathroom and I whispered a prayer of thanks and relief to God that she was ok. Or at least seemed ok. Throughout our loitering we noticed cars pull up and deals (probably illegal) go down. I was stuck between feeling awful that my kids were getting this kind of exposure to just not even caring because at least it was warm. I was so happy to see 3:00 show up on my clock. When we got over to the station, we hardly even cared that we were in the cold again, we were all a little bit traumatized and glad to be out of the doner place. It’s funny what perspective can do for an attitude. We heard an announcement over the speakers, but it was all German, so we didn’t understand a word. When we saw 3:30 come and go without a train, we asked a man who was there in the cold with us what the announcement was saying. He informed us that our train was going to be an hour late! I looked at Lynn and said, “I can’t go back over to that doner place! Please don’t take us back over there.” Which was a silly thing to plead as he wasn’t about to take us back over there. However, that left us on the freezing cold platform in the dark cold night to wait. We all tried to find our own way to cope. Jarod curled up on a bench and tried to just get into a tight ball like an armadillo. The girls sort of did the same on the other side of the bench. Lynn and I literally closed ourselves into a phone booth (yes, they still have some of the old time looking Superman-changing telephone booths over here). The gentleman who had let us know about the delay took a double look at us and just smiled and shook his head. We were desperate and didn’t care. Yes, it is beginning to sound redundant, but it literally was one of the longest hours of my life. When the train finally arrived, we were delighted to be in the warmth. Then I realized that my seat next to the window had some sort of air vent that was blowing cold air that I couldn’t control. I was swept back in time when we would go on youth activities with the teens at church on our big MCI touring bus and it would blow cold air at your face all night. However, it wasn’t quite as bad as being out on that train platform, so I curled up and just tried to sleep. Our traveling adventure wasn’t over yet though. We had two more train changes before we would make it to Rome, so I had to set a timer on my phone so as not to sleep through our stops. Because of the first train’s delay, it had a domino affect on all the other trains for the day and we had to keep getting in lines to get our reservations exchanged. I will say that throughout Switzerland, the train station personnel are very helpful when travelers find themselves in these situations. Thankfully the rest of the day’s travels went relatively smoothly thanks to them. We rested and took in the picturesque landscapes like going around Lake Lucerne Switzerland and pleasant people that we got to meet like the American widow who had moved to Europe for a change of scenery after losing her husband. She was encouraging and helpful with tips and warnings for our time in Rome. On the fourth and fifth weeks of our time in Germany we stayed close to home (feels a little bit odd to use that reference) with the exception of just a couple of day trips around the area. It was nice to get our homeschooling in and have a little bit of a routine around the house. Lynn worked upstairs in Bro. Walters office area getting sermons prepared for Sundays, working on the Bible Study and trying to work ahead for when we returned to the states. The kids were able to get lessons in and even get ahead a little bit in their lesson schedules. Meanwhile, I was still plugging away at trying to learn my way around the grocery store and run a house in a foreign country. We were also able to do some outreach and passing out invitations to the church with some tracts. It’s a little bit hard, with the language barrier to start good conversations unless we can come across someone who speaks English very well. Passing out these tracts is about the best we can do in this area. We’re just praying that the Lord will use it to further his kingdom some way. So, keeping it real here, my Sanguine/Melancholy personality has struggled a little bit with the German people as a group. When I go to the store or anywhere publicly it is with some anxiety. People, in general, don’t smile or wave or even sometimes acknowledge your presence. I’ve even been hit with carts at the grocery store when I’ve paused in front of a freezer section too long. Of course there are exceptions to this every now and again. However, coming from Oklahoma, where people wave from their car if they don’t even know you or neighbors smile and wave as they are out in their yards, it seems very cold and stoic over here. My personal bent is to smile and wave at people and they just think I’m plumb crazy here in Germany. I don’t think it’s a meanness, but it sure does make me sad and certainly matches the mood of the area on the cold, gray, and cloudy winter days. Some have explained to us that where Americans tend to be friendly on the outset publicly, they are perceived as superficial by the German people because their friendship seems to be fleeting when needs arise. Whereas, the German people may seem unapproachable, but once you make friends here, they are loyal, real friends who will be there for you in good times and bad. Of course, both of these viewpoints are gross generalizations of both people groups, but I can see where they may think these thoughts, though I would hope it wouldn’t be true of me as an American. And yes, it did make me a bit self-conscious for a while as my personality isn’t going to change just because I’m here, but I’ll let God sort that out in people’s minds. 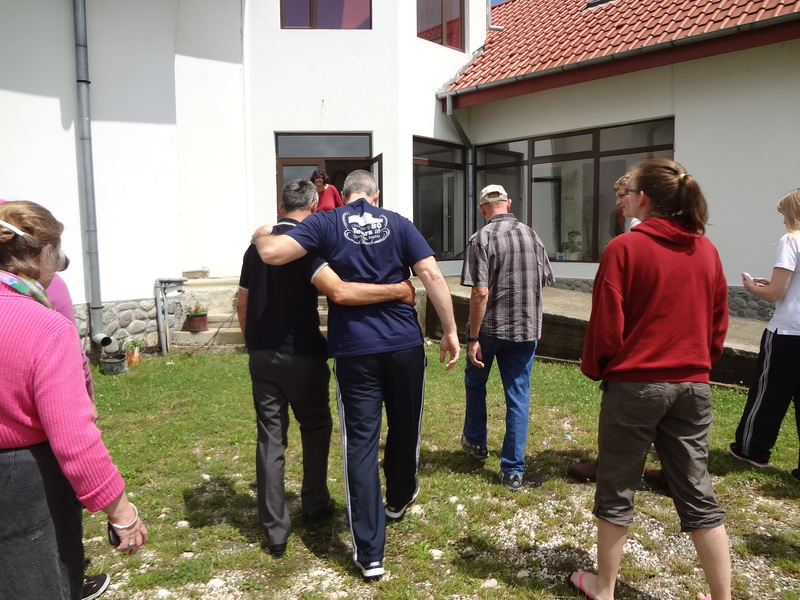 However, one of the blessings of being in a mission work for the length of time we are here is that we get a chance to make some new friendships. In spite of my above statements about the Germans as a whole, the people of Rhein River Baptist Church have been so welcoming to our family, and in these weeks in particular we were able to get to know two familys a bit better and spend some time with them. Our first outing was to Luisenpark in Mannheim with Evan and Katarina (Kat) and their two kids Robert and Addy. Apparently, every winter Mannheim puts on something called Winter Lights each night at the park through the end of February. I like this idea rather than just having Christmas lights through December. It kind of makes January and February less dreary. We met at 3:00 at the park and when I say park I mean a large scale kind of park. In Ponca City, our parks are on the small side, maybe a walking path, definitely a playground area, or even a splash pad, but this was not like that at all. I add this because I wore the wrong shoes! I was thinking something like, “Oh a nice little park with a few lights and maybe a duck pond or something – ballet flats will do.” Uh – nope! More like walking for mileS and yes the “s” is capitalized. My Rheumatoid Arthritis was not very happy with me and my joints afterward, but it was so worth it! This park was amazing!! There were, of course play areas for the kids, several giant chess sets, a bit of a zoo, storks roaming around, gardens, a Chinese tea house and just miles and miles of beautiful picnic, walking and play area. We ate at the restaurant on the property as the sun went down and then walked it all again to see the winter lights. These were just breathtaking. Even better was the company. Evan and Kat are really special people. He is American and she a Russian/German. They had great stories and history to give us as we walked and chatted. She told me how her family were part of a group of Germans who had lived in Russia for a time. They had a community just on the border that was all German speaking. I had never heard of this before. They both have a love for the Lord that seems genuine and sincere and growing. We so appreciated them taking the time to show us this wonderful place and educate us a bit on Germany and its people. In a day and age when time is so valuable, we appreciated them using the greater part of a day to get to know us and host us. A few days later we went to Speyer, one of the oldest cities in Germany founded by the Romans. 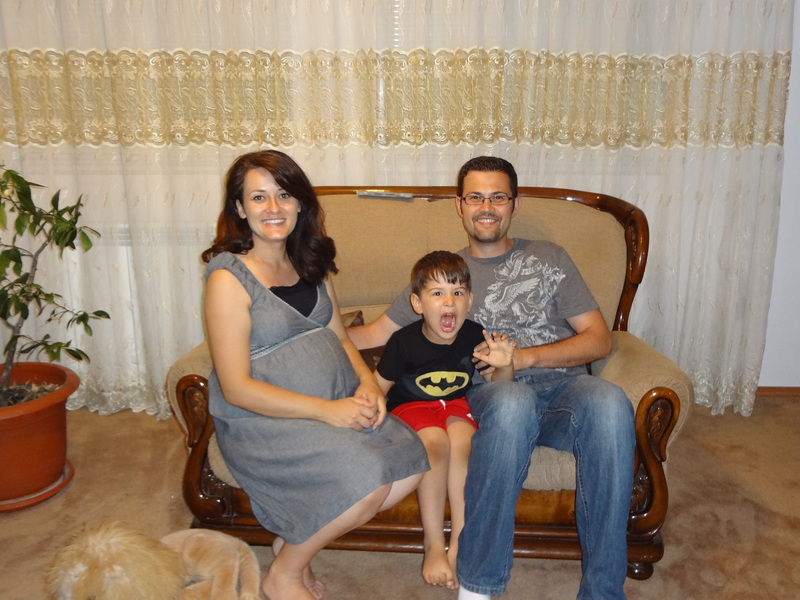 We were hosted for the day by Rene and Marina and their three kiddos, Leah, Timmy and Baby Ben. Rene and Marina are both German and this was Rene’s hometown. This town was A-mazing! It had that old European feel to it with people out and about everywhere! Lots of little shops and a town clocktower which is actually called the Old Gate that was part of the city gate in medieval times. It is about 180 feet high and was built somewhere between 1230 and 1250. I couldn’t help but to feel compelled to touch it as we passed under the archway – to feel the history that it contained in some way. Rene and Marina walked us all over the town visiting old churches. Old is a relative term here as one of them was “only”100 years old which would be very old in my American experience. However, they also showed us the Dreifaltigkeitskirche (and no, I cannot even begin to pronunciate this!) which was built in the early 1700s as a part of the protestant movement. When he was a child, Rene’s church family met in this church building for a while. Then, to beat both of those, is the Speyer Cathedral which was founded in 1030! As you walk around this cathedral you can see the difference in stonework as it has been through many war times and has needed repairs through the ages. We ended the day with the most amazing food at a local Greek restaurant called Korfu. My mouth is watering just remembering this meal! More importantly we got to know Rene and Marina on a more personal level and consider them new friends as well. As a matter of fact, later that week their baby, Ben had an accident in the home and crushed his little pointer finger. It was scary for all as we prayed for them to be able to save his finger. They had to do a surgery to try to save it and now, some 5 weeks later it’s doing so much better, but he still has to jump through some hoops before we know if the finger is saved. He was the cutest little patient in the hospital though, and still had the ability to give us all a smile! Getting to know all of these church members better has been a blessing to our family. We came to be a blessing to them, but, per usual and praise be to God, the opposite is true. On our third week in Germany we were starting feel a little bit more comfortable in our surroundings. This is when we decided it would be a good time to venture out on our first rail trip. It was the week of Valentines Day and my birthday, so I had the perfect place in mind Hohenschwangau! Yes, it is a mouthful. This is located in the southern part of Germany in the Bavarian Alps region. What I specifically wanted to do was visit the Neuschwanstein Castle – yes, also a mouthful. (Honestly, I don’t know how German kids pass their spelling tests!) This castle is famous to Americans because it was Walt Disney’s inspiration for Cinderella’s castle at the one and only Disney World in Orlando, Florida. It’s famous to Germans because of its mysterious builder King Ludwig II who died before finishing the castle. We left on Wednesday morning of this week after our Tuesday midweek Bible Study. We were so excited to actually take the train somewhere! (I will insert here that I am not a great photographer. I realize this is not a good quality in someone who keeps a blog. However, I get caught up in the moment so much, that I just end up taking it all in through my eyes and forgetting to pull out my camera or pulling it out too late, but I think I got some good shots by which to remember this fabulous trek.) The train is nice to take because it saves energy mostly. It can still be long because of all of the stops along the way, but nobody had to drive or navigate us so that we all arrived ready to enjoy. Change of scenery in just a matter of hours! I thought maybe that we would have to cancel the trip. Lynn woke up with a mysterious pain in his elbow in the night. When he awoke in the morning it was red and swollen. By the time we arrived at our destination, the picturesque town of Füssen, it was huge, red, swollen and excruciating to touch! So, though we enjoyed the trip down, he was constantly reminded of his pain with each movement. We decided that maybe we should find the apothecary and they could direct us to a clinic or something. Thankfully, the lady at the apothecary could speak enough English to tell us where we needed to go, but her English was broken enough that we misunderstood some of the directions. We ended up walking around in the freezing night looking for this clinic! When we finally found it the Dr. there was stupefied as to what the cause was. She said they could do a blood test, but that would require him to stay in the hospital overnight – not something we wanted to do. She didn’t see any reason to believe that it was an infection and thought maybe it was gout. However, she wasn’t completely sure, as this doesn’t usually show in the elbow in a man of Lynn’s health. She basically gave us ibuprofen and sent us on our way. It has since gone down, but we’re putting it on a list of things to check out when we return to the States. Since we were on foot for this trip, we decided that we should have the hospital call us a couple of taxis to get back to our Airbnb apartment. Lynn, Katie and Jarod went in the first and Megan and I took the second car. We had quite a scare as he drove as if we were in some kind of high-speed car chase! Then he dropped us off a block from our apartment. Since he couldn’t or wouldn’t speak English we just laughed and walked the rest of the way back. In the morning we made our way on the bus over to Hohenschwangau to see the castles. Yes, Ludwig II’s father also built a castle in the town which was a beautiful tour as well. Here are some pics outside of that castle. It was finally time to get up the hill to take our tour. This was the exciting part of our day. The castle sits up on top of a hill. A hill that takes over 30 minutes to walk! There is the option of a bus that can take people part way up the hill, but since it had snowed recently the bus was not running. We decided to go with option three – a horse drawn carriage that would take us up part way. However, the line was so long for the carriage that we missed our allotted time. Thankfully, Lynn talked to the people at the castle and they allowed us to go on the next English-speaking tour. It really was a marvelous experience to see these beautiful castles! Like we stepped into a fairytale land. We were able to linger around and take some fun pics outside of the castle. On our carriage ride back down the hill we squeezed in with a group of Asian ladies who seemed to be having a fun time. I noticed the woman beside me was trying to take a selfie, so I kept ducking out of the way until she finally let me know that she was trying to take the selfie with me! Then they all started taking pics of our family! They spoke little English but were able to tell us they were from Korea. After a slight pause they clarified “SOUTH Korea!” When we saw the same group of ladies in a store down in the town, one of them approached Jarod and rubbed his face! Guess they thought he was as cute as his momma thinks he is 😊. Valentine’s Day at the Castle! After our castle tours, we boarded the train again and headed for Innsbruck Austria. It was only a three-hour train ride away and we thought it would be a great experience to get to see a little part of another country. We weren’t going to have much time for exploring as we needed to get back to Mannheim for Church on Sunday. So, we decided to take the cable car from the middle of town up into the mountains. Before we went on this trip, I made sure that we all had new hats, gloves, coats and boots. I was ready for snow and mountains. What I was not ready for were the breathtaking views and the warm air! It was amazing to be surrounded by so much snow but not feel frigid. Check out some of our views at 7,400 feet above sea level! Coming from Oklahoma we had never been skiing (well, the girls have tried out skiing in Nebraska, but, well…). We didn’t try here either. However, we had a blast watching these crazy risk takers! We watched some of them tackle the slopes that were at a 70degree angle down. One lady that rode the cable car up was at least 70 years old and said she had been skiing this area for 14 years. At the next stop down from the summit was a landing area where most of the skiers hung out with a restaurant and beach chairs set up on a deck looking down the mountain. At this point we watched the ski jumpers doing their thing making my heart skip a beat each time one came over the hill. We took the cable car down another to another stop where we at lunch at a little Alpine café. The whole area had kind of an American beach town vibe with skiers instead of surfers. I was so grateful for the experience. Each week we’ve learned new things on this journey of ours. One thing we learned on Friday evening as we traveled home was that the Friday night trains are crowded and that means you stand or sit wherever you can if there are no seats open. So, we ended up sitting. This wasn’t too bad until the train came to a halt before we even reached Stuttgart. An announcement came on over the speaker, but we couldn’t understand as it was all in German with no translation follow up. After about 20 minutes like this Lynn finally asked some of the men around him if any spoke English and if they could tell us what’s going on. One young man said, “Something was blocking the tracks.” This is when another man approached and let Lynn know that was a kind of “code” for a suicide occurred on the train tracks. Apparently, this isn’t a rare thing in Germany as there are hundreds of suicides on the train tracks every year delaying trains countrywide. I’ve read since, that the number has even thought to be upwards of about 800 per year. Goodness, what a horrific thought! As we waited for the next hour and a half, Lynn kept talking to the man who had shared that information with him. Giving him as much of the gospel as he could as the man was clearly an atheist. However, he was very congenial and they both enjoyed talking with one another so extensively. We have prayed for this man since then. Praying that God would open his eyes and convict him of his need for salvation. It was a terrible cause for delay, but a divine appointment indeed for one man. Monday night of this week we had a final supper with the Clarks before their departure to the U.S. This is when they introduced us to a new food called the döner kebab. This is a Turkish dish that is found everywhere around here right now. We, in the states would probably call know some of its relatives, the gyro or shawarma. It’s meat, usually veal or chicken cooked on a vertical rotisserie and then shaved off into portions and served in a German pita bread with vegetables and sauce. This stuff is money! So good! After dinner we said our goodbyes and well wishes and headed back to our little apartment. We were on our own now, with high hopes of being a blessing to this church. On Tuesday morning we moved from the little Airbnb apartment to the Clarks house. Everything is smaller in Germany including the roads and cars. However, we were determined to do this in one trip, so we stuffed everyone into the vehicle and then Lynn went about stuffing the luggage onto our laps! It looked like a horder’s circus act, but we did it! It’s a strange thing to move into someone else’s house and try to make it your own. 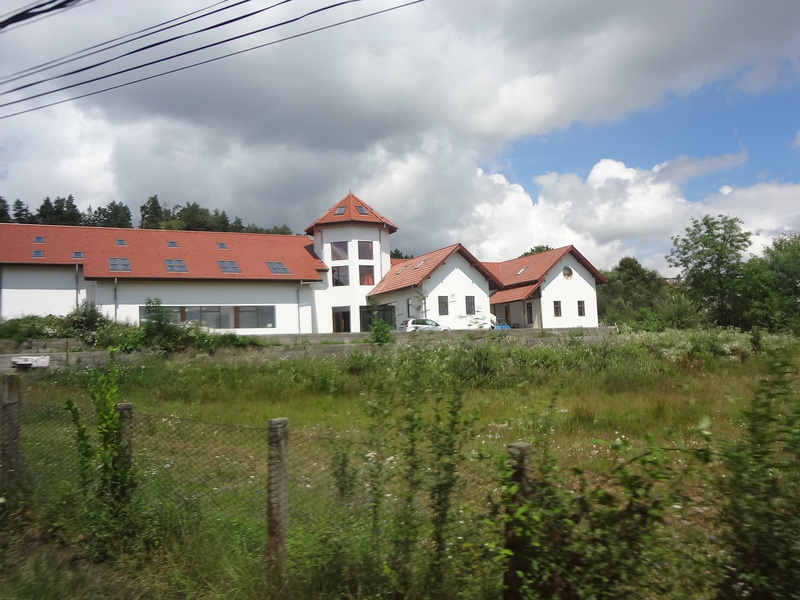 They actually have a larger house than ours back in the states with four floors counting the basement. We aren’t used to stairs and especially ones that tend to curve upward and are hard stone. I’m pretty sure it’s going to be a feat of great proportions if we all make it home without anything broken. All of us have had a slip or two on the stairs as we are getting used to going up and down. We’ve found that we don’t even go down without assessing if something needs to be taken with us, the same with going up. I’m also hoping for some calories burnt by this as well. That evening was our first Bible study night. We planned on leaving early to make sure we got there before everyone and got the church set up with the tables to sit around for the discussion. Well, we headed out a little bit later than planned and wouldn’t you know we got lost on our very first time out! We left the house about 15 minutes later than we had planned. It was dark out and our first time navigating out of the little town of Brühl and into Mannheim, which should normally take just around 20-25 minutes. The Clarks had put the church into the GPS system of their vehicle, but she takes some getting used to. She’ll say things like, “take a right and then go left,” this can be very confusing at times, but we’ve learned that she means that some exits on the right have you travel further down the road so we must stay left until our actual exit. We didn’t know all of that then. So, the very first exit we needed…we missed. One of the quirks of the Autobahn is that if you miss your exit, you’ll probably be traveling a few minutes before there is another one where you can turn around. We finally got turned around and wouldn’t you know we missed another exit! By this time all of us were feeling the panic. You know that feeling where you panic, and you can’t think about the simplest of solutions? Well, we were there. Poor Lynn! I can only imagine how frustrated he must have been inside as he was trying to navigate himself while little miss GPS was also trying to navigate, and I was in the next seat trying to navigate him as well! When we finally made it to the church it was 7:00 right on the dot! Thankfully, the members here tend to run late, so we actually beat them all there anyway. Whew! It was dicey there for a few minutes! We brought with us, from the States, copies of the study by Jim Berg called Changed into His Image. I’ve been through this study twice already and still learn more each time. It’s an in-depth sanctification book that’s great for discipleship purposes at pretty much any level. We figured it would aid the discussion if we have an actual workbook to go through while we’re here, giving the participants homework each week to fulfill. This first week was just an introduction night as he explained the study and how we will go through it. We also had a bit of a testimony/meet and greet so as to get to know some of the members a little bit better. I loved hearing all of their testimonies of how they came to know the Lord and how they came to this church. I’ve said it before, but I’ll say it again, I’m humbled when I realize what a small world we live in and how Christ has permeated all these different nationalities. We also started back into homeschool lessons with the kids this week. It felt good to establish a bit of a routine. This, of course, has to be a flexible routine with all we have planned to do, but routine, nonetheless. Late in the week we took the kids over to Heidelberg during the day. We were still getting used to driving in Germany as well as driving a manual stick shift which neither of us have done for quite a few years. We made it thankfully, but on one of our wrong turns we ended up on a hill of a street that certainly seemed one way since there was a stone wall on one side and it was so narrow. But, no, not in Germany they figure you can get a few cars lined up side by side in the space of about two and a half meters wide – Oh wait! Let me speak American – that would be around 8 feet. We decided to turn around in a driveway along one of the crests of the hill but backing out was also a challenge. The Volkswagen that the Clarks own has a sensor system for backing up that beeps at you. We are familiar with cars that have back up cameras that seem very helpful, but this just beeps and as you get closer to any objects it beeps faster and louder which is always a good mix for keeping the driver calm as he’s backing out in a dollhouse size area along a hill on which any second another car could come zipping around. Thankfully, Lynn did it well and we were on our way back to where we needed to be. We walked along the old town part of Heidelberg which was our first taste of old Europe and all of the beautiful architecture. We found some really cool shops including a used bookstore that was about 3 stories high with a spiral staircase in the middle of it. Katie was in a wonderland here. She just loves books and to be surrounded by all of these treasures made her giddy with delight. Of course, most were written in German, so we didn’t find any English books of interest for us, but it was still a really cool store. This area of Heidelberg is like the idea of Branson Landing (if you’ve ever been to Branson, Missouri), put into 600-year-old buildings…aka charm galore! Heidelberg university is also situated in this area and is said to be around 600 years old! Imagine the feel of walking on a university campus that is older than our own country! Because why not have a little moxie? 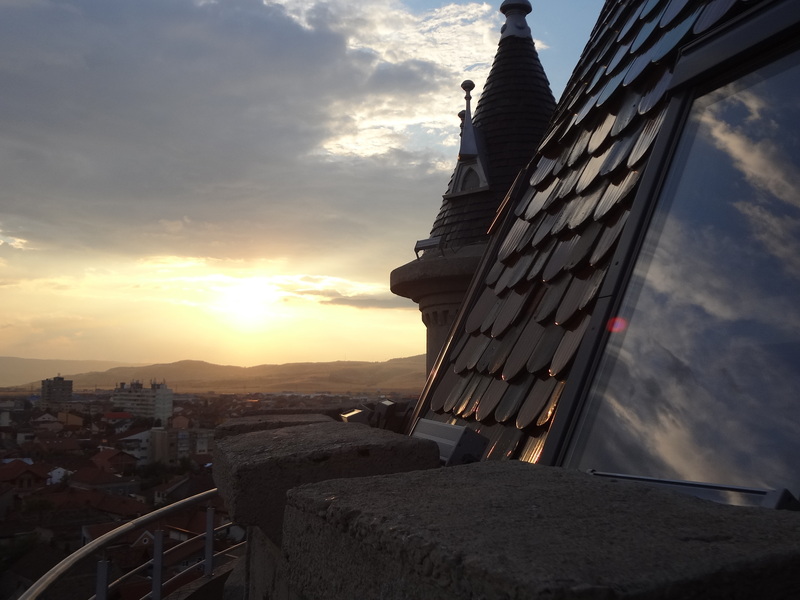 We lingered and enjoyed the day so much that we didn’t even have time to go up to the castle at the top of the hill. We’re hoping to do that on another day. Our first Sunday flying solo went very well. At first, we were a little worried as, again, people showed up just right on time or a few minutes late, and I mean everyone. However, we were relieved when they did show. Our kids have taken on the challenge of running a Children’s Church program for the young ones which went very well. We brought over some Abeka Bible story cards and the girls are each taking a week teaching the lesson while Jarod helps with singing and games and helping the little ones listen. Lynn brought an awesome message called “Don’t Pray it Safe.” He’s preached this before, but has to go through his sermons and do some editing for the cultural nuances and applications. 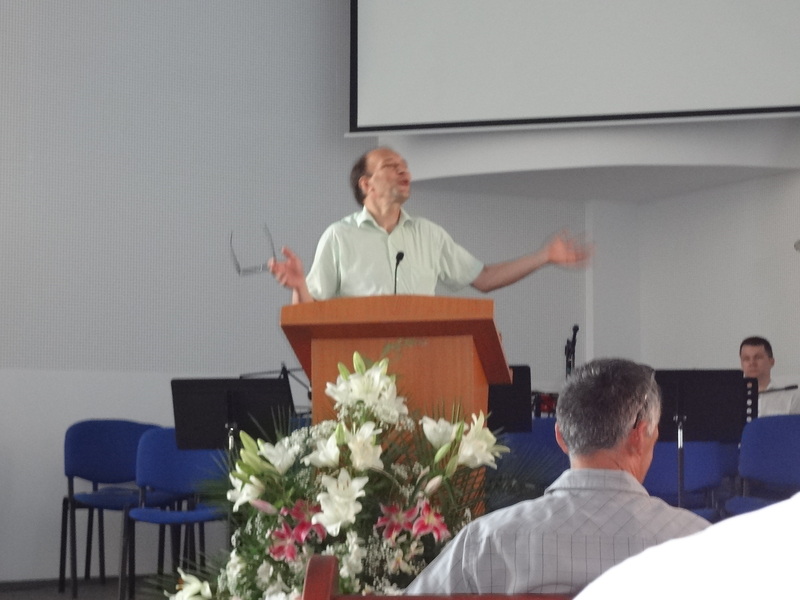 He did a great job of preaching and communicating his message without losing anyone language wise. After service we realized that these folks like to talk about the message! This is great as it provides feedback to Lynn on how they understood the message and it’s also encouraging to know that they aren’t just listening but are thinking it through as well. This is always an encouragement to a minister when he knows that the crowd connected with the message. After church a sweet family from the church, Rene and Marina, invited us to dinner with them at a local döner place that they frequent. We enjoyed getting to know this sweet young couple and can sense we’ll be good friends through this experience. Well, that’s the week two highlights. More to come as we adjust to living here in Germany. Exhaustion thy name is jet-lag! I cannot recall when I have been more physically tired in my life than upon the day we landed in Germany. We flew out on Monday Jan. 28th at noon from Oklahoma. We landed at 8am Jan. 29th in Frankfurt, Germany. However, to us it was more like 1am! The Clarks met us at the airport to help us get our rental car and settled into our apartment for the week. They encouraged us to NOT give in to the overwhelming desire to take a nap, but one by one we fell prey to this debilitating fatigue. I believe someone could have performed surgery on any one of us without the threat of our awakening. Truly this was awkward in many ways. For one, we have never been to their home in Germany. I was hoping my kids, as well as Lynn and I would give a polite and warming first impression. But the luring weariness, just controlled us all. Here I was excited to be in a new country and see my friends’ home for the first time and I simply laid out on her sofa and fell asleep! When I awoke looking for Lynn, I went up to their third floor bedroom/office to find Bro. Walter studying at his desk while my husband was practically passed out across their bed! 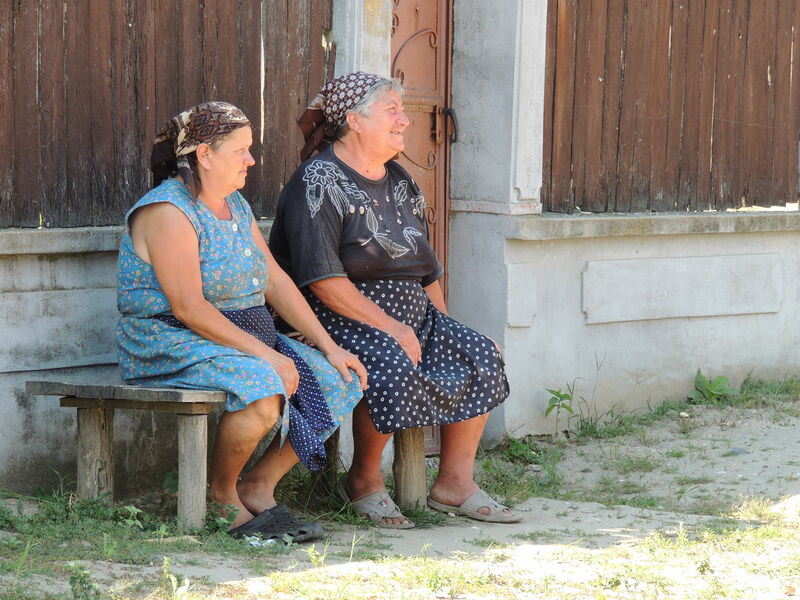 I didn’t remember having this feeling when we went to Romania a few years ago, but it was the real deal now. Our random greeter at the rental apartment we stayed in the first week. That first evening we went to the Bible Study that they hold on Tuesday nights at the church. We were all nervous but also excited to meet everyone. Bro. Walter did a good job leading the Bible discussion, but I must be honest – I cannot even remember what the discussion was as the room was spinning while I struggled to stay awake. At one point I thought I was falling out of my chair! My only hope is that I was able to keep my eyelids open enough that nobody would notice! After dinner we went to a family’s home that were members of the church. When they can, they hold a prayer meeting on Thursday evenings. We were impressed with their sincerity and openness with the prayer time for their personal needs as well as the church needs. They were all very welcoming and we enjoyed the fellowship after our prayer time. This is where we were introduced to all that the Google Translator App can do! The view from our little apartment. Yay for snow! Boo for parking, only allowed on one side of the street and usually full. We had to do a lot of walking that week. Driving was an intimidating concept to say the least. Only Lynn was on the rental as a driver since we would only have this vehicle for the first week until the Clarks left for the States. However, as I observed and learned the rules of the road along with him, I was overwhelmed. There aren’t any stop signs over here, just turnabouts. This is a good thing in my opinion as it keeps the traffic flowing. However, there are many more pedestrians and bicycles than what we ever see in the States. Our family joke has been repeating Bro. Walter when he told Lynn, “Watch out for the bikes and pedestrians. They really frown upon hitting them over here.” As if they don’t frown upon that back home. But we understood what he meant, they have rights over here and are in more abundance over here than at home in Oklahoma. So added to the observation of the driver is the roundabout rules, the yielding rules to the side roads on your right and the bikes and walkers. This doesn’t even touch on the Autobahn and all the rules of that road. you can practically feel the breeze as cars speed by at warp speed. Believe me there are no problems with people dawdling in the left lane around here! This guy was hanging on the wall at the Schnitzel restaurant making me feel guilty throughout my meal. Schnitzel: Walter and Dalene took Lynn and I into Heidelberg on night three. By now, we were still tired, but able to function like normal humans. This is where we tried Schnitzel for the first time. Basically it’s chicken fried pork cutlet with any of 101 sauces over it. The atmosphere was great, the company was great, the conversation totally enjoyable. The schnitzel -meh. I think it will have to grow on me. I guess I have 100 more options to try before my final verdict, but so far, I do not care what Julie Andrews says, this is NOT one of my favorite things. We walked around Heidelberg that evening and totally enjoyed the old European flair of this amazing city. The castle was lit up above us on the hill and was awe inspiring to behold! Lynn and I both felt like we were at an amusement park in the States that was built to look like we were in an old European city …but, no, it was real! Heidelberg at night! The castle is so pretty all lit up! Grocery Shopping: Dalene took the girls and I into town to grocery shop on Friday. We started with the bottle recycling area. Fun times recycling plastic bottles! Seriously, we need this back in the States. Side note: Germany is green extreme! This is not a criticism, it’s an admirable thing. The garbage isn’t even near the same as they recycle everything they can, so there are four trash bins, paper/plastic, compostable, glass, and then the “everything else” bin. As good a thing as it is, I’ll admit, I suffered from a paralyzing fear of putting something in the wrong trash bin for the first week or so. Basic run of the mill garbage cans in Germany. Can you see why I got nervous? Anyway, we were walked through the steps of taking plastic bottles to recycle so we could get credit on our groceries. This wasn’t much different than when I was a little girl and we would take in our glass pop bottles to get dimes at the grocery store. We were at the store for a couple of hours I’m sure as Dalene showed me the differences and how to find the things I’m used to finding. This proved to be one of my biggest culture hurdles at first when I tried this on my own and felt lost and rushed. Thankfully, that church members who introduced us to the camera feature on the Google Translate App saved my life as a shopper! I can scan the shelves at the store and translate items so as to choose the right one. It’s not 100%, but it sure is a life saver! It still takes me a couple of hours to grocery shop, but some of that is my own dilly dallying around the store. How Cool is this grocery cart feature! There’s a little extra shelf that flips out when needed. I could also see myself using this as a step stool #shortgirlproblems. As you can see all stores work like Aldi back in the States. You have to put a coin in to get your cart and you get it back when you return the cart. You also have to bring your own grocery bags/baskets or buy them from the store. Bratwurst (brot vurst): On Saturday of our first week, we went with the Clarks into downtown Mannheim. It’s a bustling large city like most I’ve been to, so the size wasn’t too unfamiliar. Of course it mixes the old with the new as some parts of the city or buildings are older than our own country! It was here we tried our first pretzel on the street – oh so delicious! Then, for our first real German bratwurst. Of course I didn’t get pics because I was too busy stuffy my face. This too was delicious and large! It was a delightful day navigating around this large metropolitan area. Our favorite part was the marketplace that had stands with fresh cheeses, olives, flowers and the list goes on. It was abuzz with people everywhere. It was unfamiliar with the language barrier and trying to navigate a large city, but we felt at ease having the Clarks with us as guides. Money: We fast learned that people in Germany do most of their transacting with cash only. Even Burger King! This wouldn’t have been a big problem but that even though we had gone to our bank before ever leaving the U.S. to make sure our ATM card would work, we still ran into problems. After a few emails with our bank’s fraud dept. things were set straight and we were able to access our accounts and navigate on our own without having to constantly trade money with our friends. Church: The whole reason we are here! We went with the Clarks in the morning to a service of another missionary in town who holds his services all in German. It was a good service, well as much as we could get out of it. We did feel our novice status here as we were observers more than participators in the service. However, in the afternoon at the service with the church for which we came to help, we were able to feel more at ease. They share the same building as the church that holds the morning service, but minister to an entirely different demographic of people. 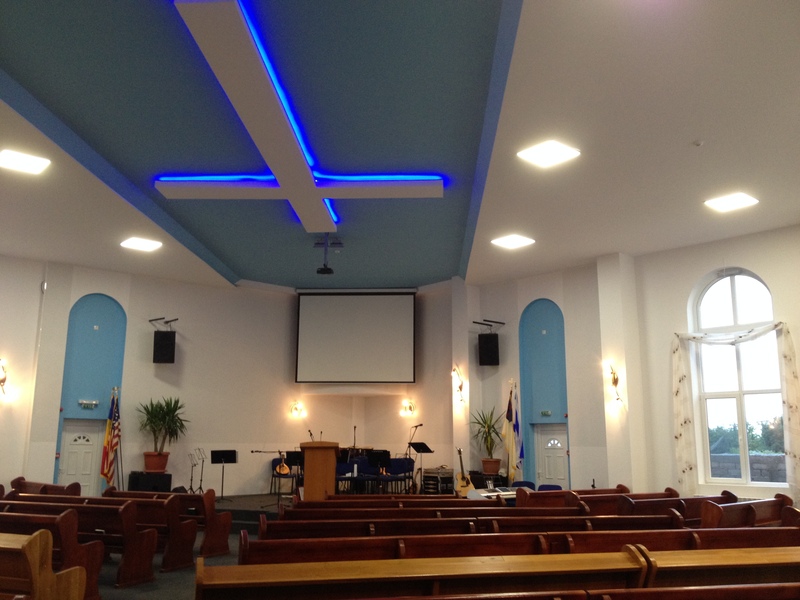 Rhein River Baptist Church is made up of an international group who all speak English due to their diverse backgrounds. There are people from Brazil, Russia, the U.S., England and Africa all in one little body of believers. I love this diversity as it feels like a glimpse of Heaven to me! Sometimes, in day to day life we get caught up with our own little part of the world and forget that we have brothers and sisters in Christ all over the world! I find it such an energizing feeling when I am able to meet people like this! Of course this is also a relieving detail since Lynn doesn’t have to learn an entirely different language or work through an interpreter for this short 3-month stint as filling the pulpit. Since it was also the first Sunday of the month, they have a time of pizza and fellowship after the service. This was an enjoyable chance to get to know some of the members and chat for a while. The Clark family. Our favorite Germany missionaries. Ready or not here we go!! Time – it’s always such a fleeting commodity in this life, especially when it isn’t managed well. Now, that mine is slowing down for a short time, I can look back and see that more clearly. Excuses are always abounding, I started working as the Pastoral Secretary at our church, it just kind of happened one day while I was filling in while our staff went through some changes. Then, after a while it became a permanent thing. It’s a blessing, and the timing was right, but being the part time secretary is a bit of an oxymoron at a bustling church like ours. We have one of the busiest calendars in the land. With that comes the people work, which usually is the heap of the time spent. Paired with continuing to home school my kids and those same kids getting older and busier themselves, can lead to a full-on anxiety attack on any given day. Don’t get me wrong, I love the work, I mean, love it! I get to sit in an office across from my husband’s office every day. We have five ministers on staff, and I love every one of them! I love their wives and the other part time staffers as well. I mean, we have THE best staff in the land. I would vacation with them all! We work well together and even get frustrated well with each other. The humor is never lacking in our office. Even when I have a bad day, these guys know how to make me smile. However, I still fall prey to mismanaging my time – often. It’s a gift, or maybe a curse that I have. My personality is bent towards spontaneity, which can be good when fun is to be had or I get a creative spurt that needs to be followed. But day to day, it can get out of hand and that’s exactly where I’ve been this past year. Anxiety city. And then God…. He knows what we need, and he knows what we want, and he cares about them both! Oh I’m not saying that we always get those things that we want, nor should we, but like any good parent (even better!) he allows for those wants when it works within his will. That is exactly what he’s done for this family. Friends in Need: We came to Central 21 years ago when the Clark family was just starting their internship. We were both young couples excited about new ministry. This led to a friendship that would span continents and time. Dalene and I became fast friends. They already had two girls, but we were pregnant at the same time with my now oldest, Katie and their third, Kyndall, (who are both going off to college this next year! Sniff sniff). I still remember us with our babies at the airport seeing them off when they initially left for Germany. We’ve always picked up where we left off, whenever they’ve been able to come back on furloughs. Now, there was a legitimate need at this work they are in and we would be able, as friends and colleagues to be a help to them. How awesome is that?! Answer to prayer for our son: Just last summer, while our girls were away at camp and we had only our son at home, we had an emotional discussion with him about his sisters. He was feeling a pressure and desire to be closer to our oldest but felt like he just didn’t connect with her due to the age difference among other things. He was in tears just thinking about her going off to college in only one year and not getting that chance. Just as we, as parents, were absorbing the idea that our family was on the brink of change with our kids growing up and leaving, Jarod, too, was rolling around these thoughts. We encouraged him to pray about opportunity over this next year to grow closer as a family while we had the time. Then, along comes an offer of just the 5 of us in Germany for three months! What better way to grow closer as a family than through stepping out of all of our comfort zones together with no peers along for the ride or crazy work, school, youth group schedules to contend with? Opportunity for life decisions: Our middle daughter, Megan, has wanted to be a missionary since she was a little girl. Her hero as a child was Amy Carmichael, she even dressed like her one year for our fall festival. However, last year, she read a book. It was a good book, that was challenging teens to consider their futures. Sounds good doesn’t it? However, she seemed burdened by a statement by the author who challenged readers to reconsider their own desires and make sure it was God’s will – also, a good thing to do. She seemed to be confused and burdened by this, though, wondering if she was just in love with the romantic idea of going to far off places as a missionary or if it was really God’s will for her. Again, what better way to get a taste than to actually go on a mission trip, not for a week but for three months. Getting to feel what it is like to be away from home, comfort zones, and all things familiar. Yet, she gets a chance to do this with, at least, the comfort of her family with her and the knowledge that this is just a short-term commitment. We’re praying that God will show her His desire for her during this time. Time with our oldest: Just as our son was wrestling with the fact that our family dynamic is about to change, we have been wrestling too. I absolutely love where we are right now with the ages of our kiddos. We embarked on this parenting adventure knowing that we were raising them to send them out. However, the fact of that time coming soon, weighs heavy on this momma’s heart. I’m a bundle of conflicted emotions. Excited to see where God will lead her and how He will use her and also heartbroken at the thought of missing her. Not seeing her face daily, hearing her laughter, seeing what cool pictures she has drawn recently sitting on her bed listening to music, or even just enjoying a movie together or dinner time conversations. It’s natural, it’s good…it’s heart achingly coming too soon! I treasure the thought of 12 weeks to just huddle in close with my babies and absolutely absorbing each moment with them. My desires: I have long wanted to be able to take my kids to see things in this world! We’ve done the Disneyworld fun trips, but I have expressed multiple times how I’ve wanted to take them on a mission trip so that their eyes may affect their hearts. We just haven’t had the opportunity. The trips that Second Man and I have been blessed to go on were when it just wouldn’t be feasible to take our little ones along. Not only missions work, but also, seeing some of the wonderful things in this great big world that God has created, has been my desire for my kids. Well, here it is just plopped in our laps. It isn’t the sole reason for accepting the call, but it sure was a fabulous extra! What a blessing the leadership of our church has been as well. When Pastor first posed this to the deacons of our church, one of the first questions was, “Will they get to do some traveling?” This is so important. Second Man is an extraordinarily hard worker and even hard on himself to be busy about God’s work. He’s not a workaholic, but he is exceptionally careful with the stewardship of the ministry in which God has put him. The assurance of our deacons and Pastor being behind the idea of us getting to use some time to travel while in Europe freed up his conscience to be able to do so. Reward: This is a personal matter and small on the whole scale, but special to us, nonetheless. We truly are hoping that we can consider it a reward for something personal to us, that I don’t even want to give detail about here. However, we, as a family gave something up recently that was both enjoyable and a desire of ours. We felt led out of conviction to give it up and it hasn’t been easy, both socially and personally. I don’t give details, because it truly isn’t something that I would want others to think I am imposing on them or judging them about. But I do believe in a God of rewards and can’t help but consider that maybe that would play a part in this. I won’t truly know that until I reach Heaven and get to ask Him about it, but for now, I know that this is a blessing in our lives! Time: The mere logistics of this trip lend a look at time. 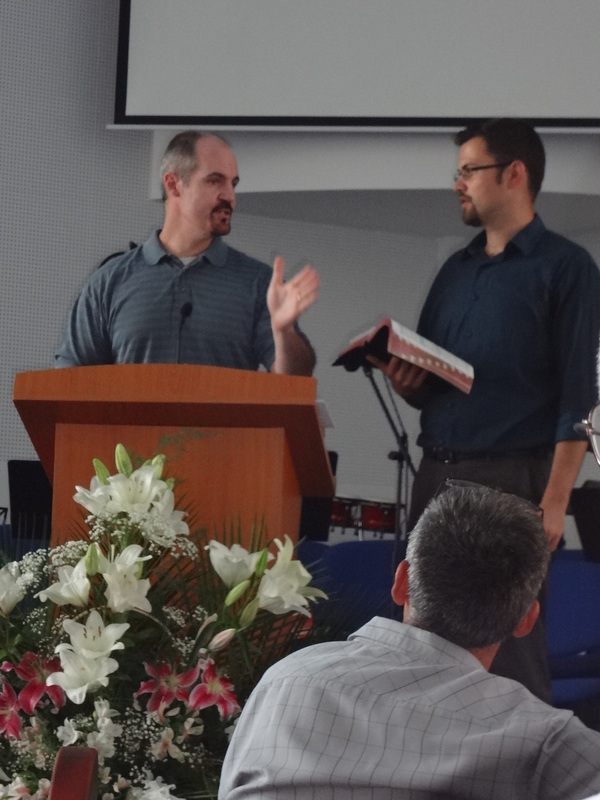 Though Second Man will be preaching each week, leading a Bible study and discipling an individual who is a shut in, his schedule and mine are both extremely lightened while we are in Germany. We need this. We both need it physically, as stress due to schedules, extended family issues, and other life pressures has taken a small toll on the both of us. I was diagnosed this past year with Rheumatoid Arthritis and am still trying to navigate my way in this new journey. He has suffered from heart palpitations among other physical ailments that all tend to come from stress and…well…getting older. We can’t deny that little tidbit, now can we? We both plan to use this time to work on our physical, spiritual and mental health. This is such a luxury that everyday normal life doesn’t always give us. How blessed we are! Opportunity to be used: How honoring the thought that God can use us to help a missionary and to get minister to people in a foreign land. How honoring the thought to do that even at home! I never want to miss the opportunity to be used by God! There is no great feeling in this world! God’s just so good! I can’t wait to see what He’s gonna do! If you’re like me, when other people report on a mission trip I kind of tune out a little. It’s not that I don’t want to hear about their experience. It’s just that it’s hard to enter into their excitement since I didn’t experience it myself. I must have heard a few dozen times before this trip about how people in other countries have such authentic worship as compared to Americans. But, how does one process that information if they are American? Does that make me a fake because I’m an American? Or does it make me somehow inferior? I mean, I’m doing the best I know, so why am I being shamed? That’s how, I usually feel anyway…just sayin. But, truly that’s not my intention in writing down my experiences here. Oh, it is much different in Romania that is for sure. But, so is the entire culture, so to say they are better than us isn’t really my point. They’re just different. I’m pretty sure there are people in Romania who just show up to church, or who don’t come ready with hearts prepared to worship, just like here in America. I do propose, though, that the number of those people is much fewer and I will explain why later, but what I’m trying to say is that not everyone there is a super Christian, just the same as here. Some go to clear their conscience, some to please someone else, or some, because they are lonely or outcast, or curious. But those who come ready, and prepared are definitely apparent and boy was it amazing to witness. Was I blessed and inspired? Oh yes…immensely. Has it changed my worship and views of church? Hmmm, maybe some, but honestly, I’ve been trying to be authentic for years now. Some years and days are better than others, and I’m sure I fall prey to the American trap of soft and non-sacrificial worship. I believe with all of my heart though, I’ve been challenged to grow and move forward with walls down and roof off. 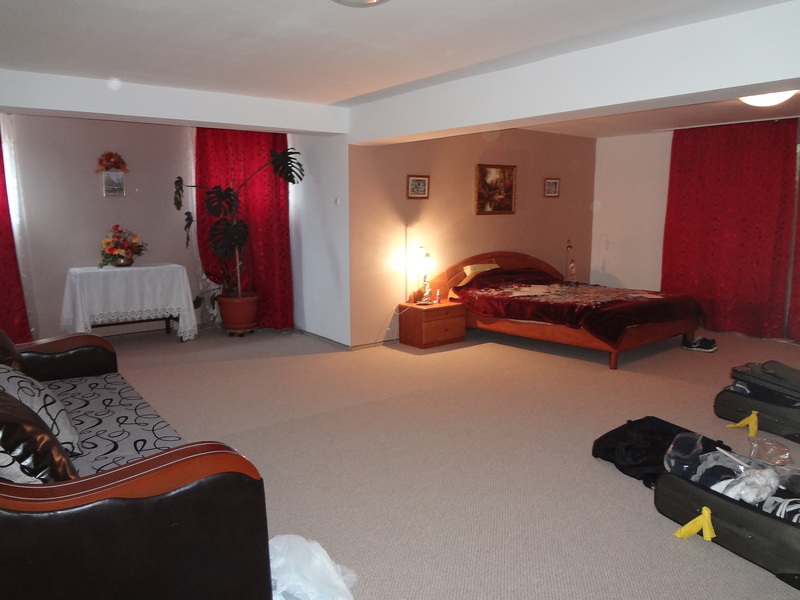 So, without judgments or offenses I give to you Romanian worship. 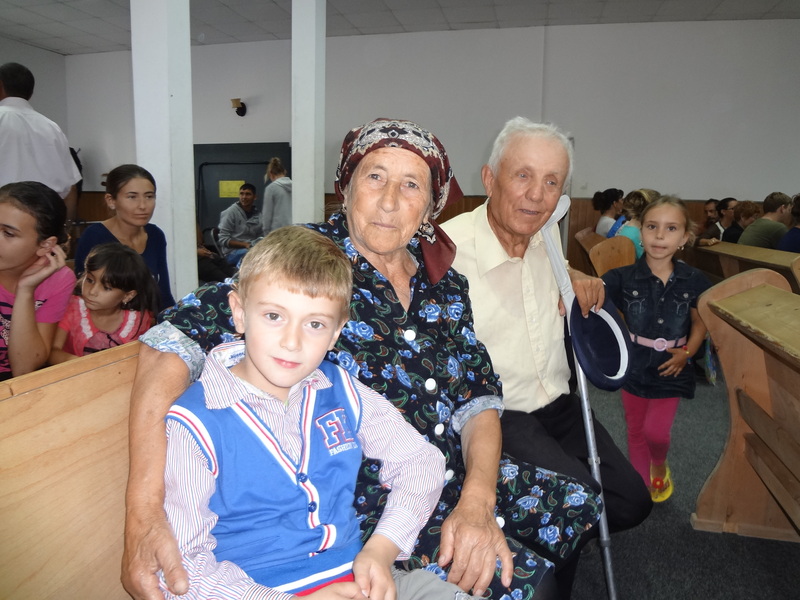 Our first Service was at the church in a little village called Rogova, where our feeding center is located. 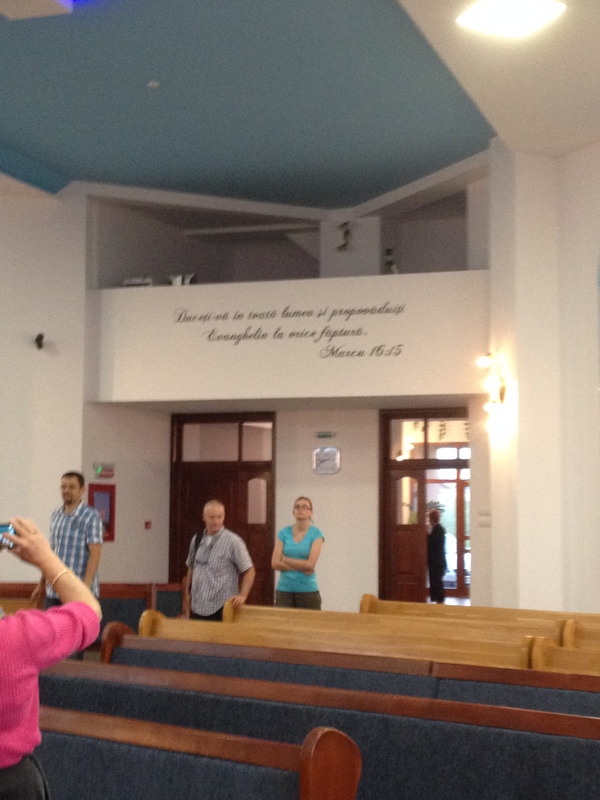 We arrived early to take a tour of the building, which housed the church and feeding center all in one. The building itself has quite a history. The Soviet Army used it for communist propaganda during WWII, then it went through different phases of being a movie house, a nightclub/disco and more. At one time there was thought to be a ghost and the people of the town said that only the “Repenters” (their name for Baptist Christians which is meant to be derogatory, but I think is great!) could claim this building for good! 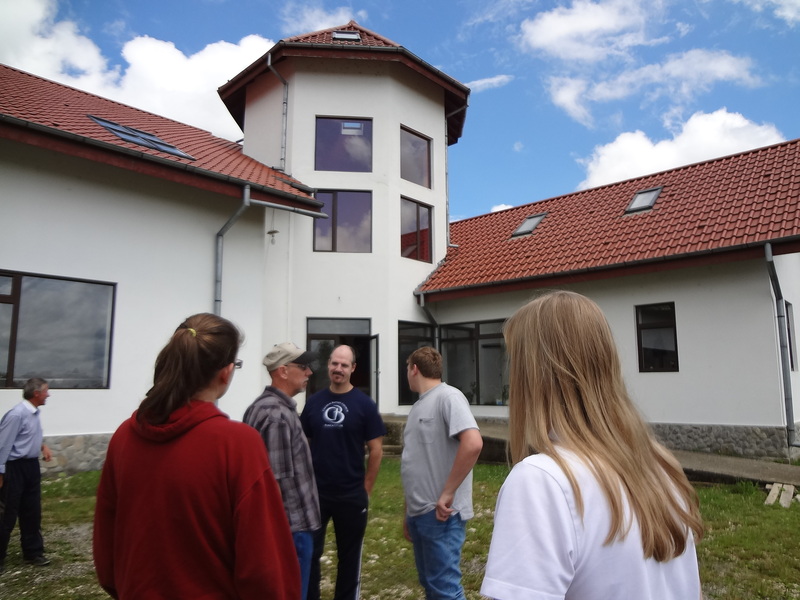 The church had been meeting in a small meeting room for a while, but after a group of teens from Kentucky had visited the ball got rolling and God provided in amazing ways for them to acquire this building. I was so excited that our church had gotten to be a part of this building acquisition and reclaiming for the Lord. Before the services started, Pastor Rica offered to take us on a walk around the village. It was more like a stroll or even maybe a saunter, for we walked slowly and as we walked people came running out to greet Pastor Rica (even people who weren’t members of the church!). Children joined us, and villagers greeted us. Most of the properties are the same set up with a house, small yard and a wall around the property. 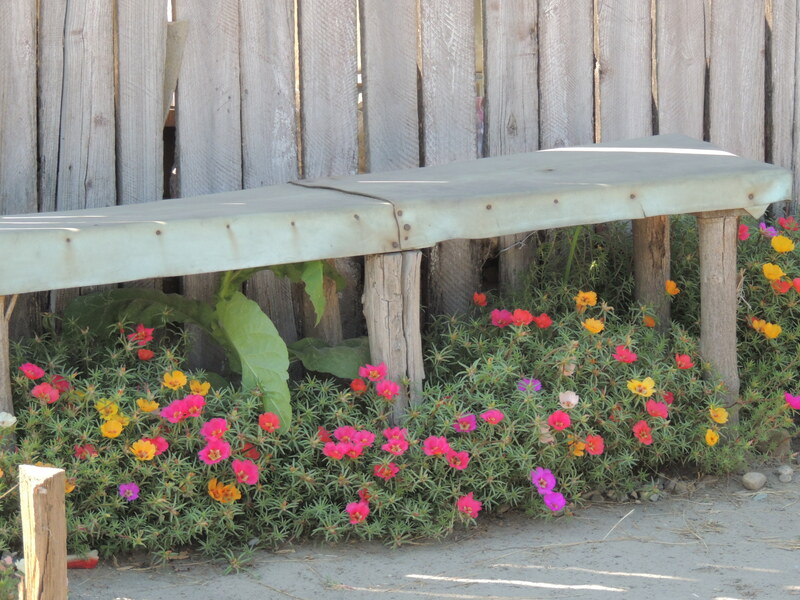 Many have benches setting outside of the front gates that they sit on in the evening and greet their neighbors. The roads were dirt and pocked throughout. There were the occasional “leftovers” from the flocks that were herded through town in the evening, so we had to watch our steps. 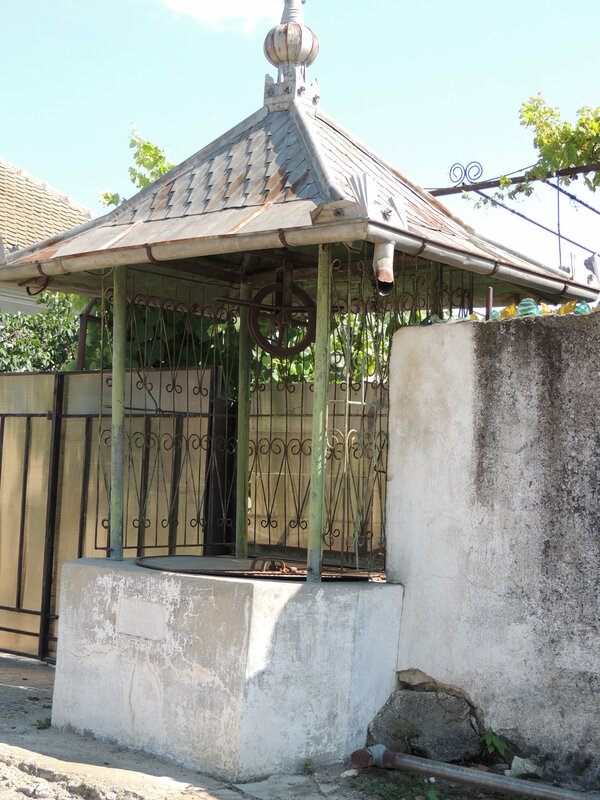 As we rounded one corner we saw the village water well, where they still came to get their water for some of the houses. 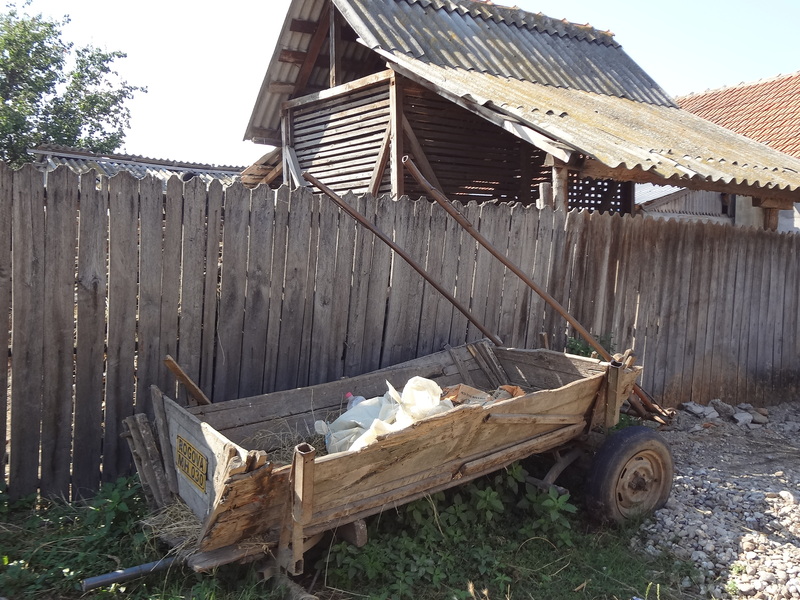 That itself is a sad topic, because most of the villagers had kidney problems from the well water. Filtering could get rid of bacteria, but there is a problem with chemicals leaching into the rocks in this area and that cannot be filtered out. It’s just a fact of life that they will have to deal with kidney problems as they grow. Poor as they were, my most beautiful impression of this entire country is that they all try to make their space as beautiful as possible. Geraniums were everywhere! 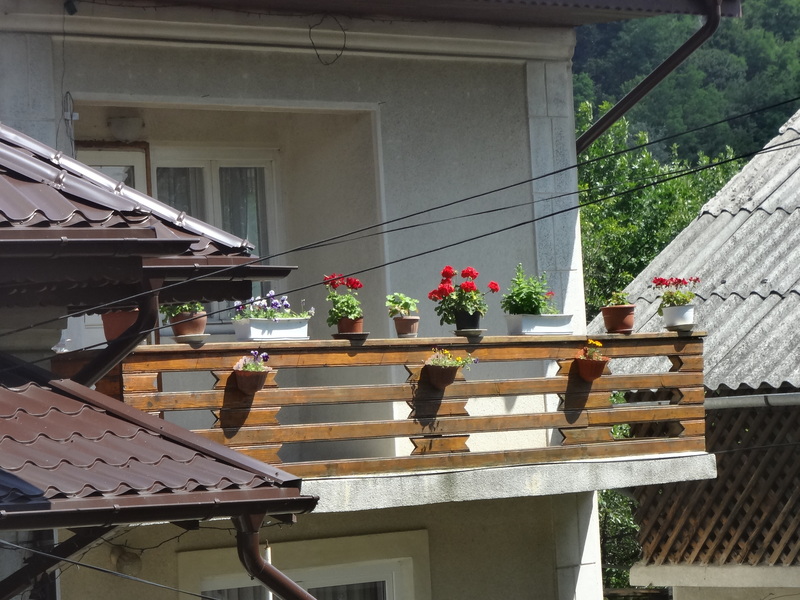 I guess I’ve always had an appeal for geraniums, so it really stood out to me. Other flowers were used as well to try and bring some beauty to their little neck of the woods. This part of their beauty was heart warming, however, what was sad was when we rounded the corner where the Orthodox Church stood. Majestic and mighty, gilded and beautiful, it was a pillar of false doctrine and thievery. I grieved the lies that were preached as the “church” used up all of the money. Small idol centers were a staple item along roadways in many villages throughout the country. It was a place people go and light a candle and pray to a dead “saint” trying to appease this false idea of who God is and what He requires. Yet, as we continued our walkabout, and people flocked to Pastor Rica, I was heartened by what he represented to them…TRUTH! He preaches a personal relationship with God through Jesus Christ. With the Bible as authority (not man or priest), He teaches them the truth that through this personal relationship with Christ we can be forgiven and set free from sin. We serve a risen Savior and a living God who cares about them where they are (more to come on this). 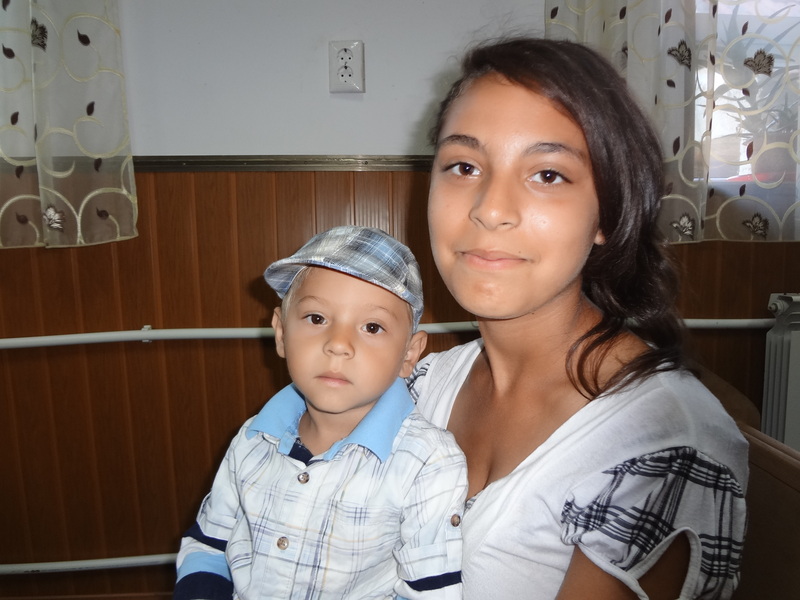 – The little boy next to me on his sister’s lap whispers something I cannot understand. His sister says in broken English ‘he says you are angel’ um tear! – The group behind me came tonight, probably to see the American visitors. They were restless and kind of noisy, I’m sure it’s a process to teach them to behave in church. The girl in front of me opens a candy bar and water and the little ones flock to her like ducks right in the middle of service! – When the little ones next to me were talking during preaching the woman to my left reached right over me and whacked them with her paper fan! She paid no mind to my being there…too funny!! – After the prayer time the mandolin band played. I love this music! It’s kind of like Euro bluegrass. 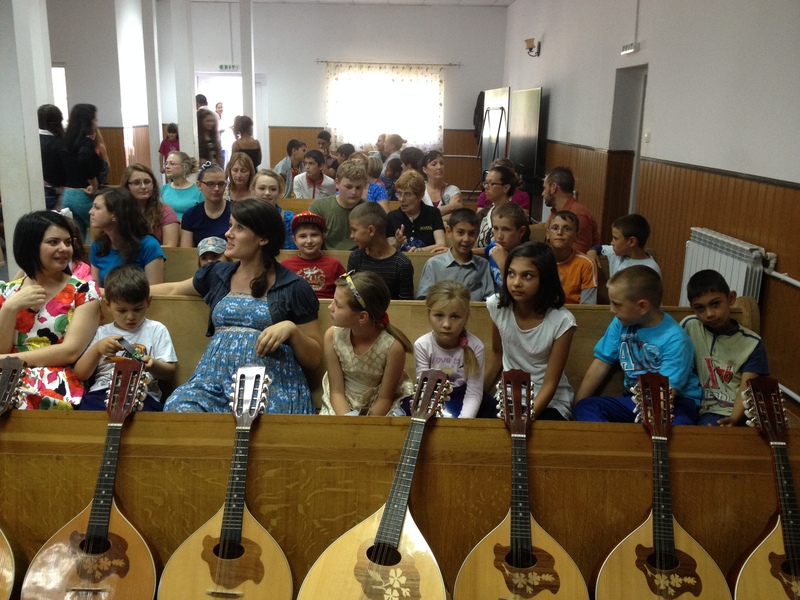 Sounded like Fiddler on the Roof…without the fiddler….mandolins instead…never mind. – Kyliegh Garza played piano and then her mom, Connie, gave her testimony of how God provided them the way to make the trip. She was visibly nervous at first, but pulled it together and did a perfect job! 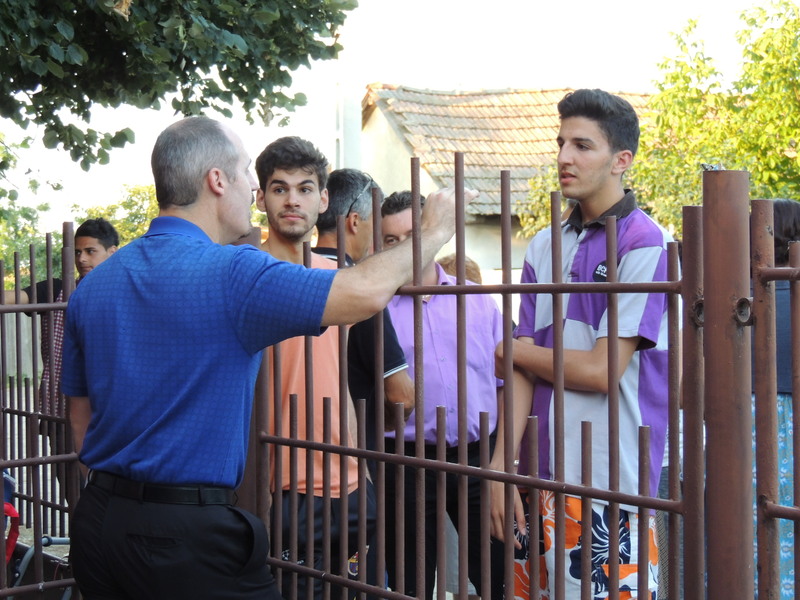 – Then 2nd man got up to preach with an interpreter or as he called it, and interrupterAfter the service a trio of Muslim teenage boys approached 2 Man and one in particular asked him some pointed questions about his claims that God cares. 2nd man took the opportunity to graciously answer their questions the best he could and you could see their countenances begin to soften as he talked to them with tenderness and not defensiveness. After about 15 or 20 minutes, they left with plenty to think about. We waited for a few minutes as the shepherds drove their sheep into town after a days grazing and the loaded on the bus back to Severin. Most of the people in this church, though wealthier than the village people, walked to and from church. As they left that day, they went through a line of us giving handshakes and expressing the word “Pace” (pronounced pacha) which means Peace. It was a word that under communist rule would let them know who was a believer without getting caught. It stuck and to this day the believers greet each other with this expression. There was a gypsy woman who has been attending lately and she just all out grabbed my face and kissed both sides! After eating lunch at the church we loaded up in the bus to head to our next church service. Well, let me back up first. A few of our ladies had to get something ( I don’t even know what) from the grocery and asked if they could walk over before we left. They hadn’t returned when we needed to leave so we drove the bus over to the store to try and find them. There had been some sort of mix up with money and communication and it held them up. So, 2nd Man, Brother Abbot and Pastor Rica all went in to try and find the ladies. As they all returned to the bus I was giggling as the men surrounded these ladies and looked just like the shepherds that had herded their sheep into town the night before. So, then, we headed to our next service. This was a bumpy 1-½ hour drive into the small mountain village of Lupsa. This village was composed of about 400 people and was where Pastor Rica and his wife Cathy had grown up. The church is located upstairs from a small Manna feeding center nestled into a hill and surrounded by dogs, chickens, ducks and even bee hives. Pastor Rica’s own mother lives in a tiny apartment in the back of this building with just a bed, and small bathroom that takes buckets of water to flush down the toilet. Such humble living. The ladies all showed up with scarved heads greeting us much he same way as the other two churches with warmth and expressions of “Pace.” The spirit was incredibly welcoming and casual. I was stupidly out of place in that I hadn’t had time to change into flat shoes and stumbled my way up the hill into the church. It was hot. No other way to put it. 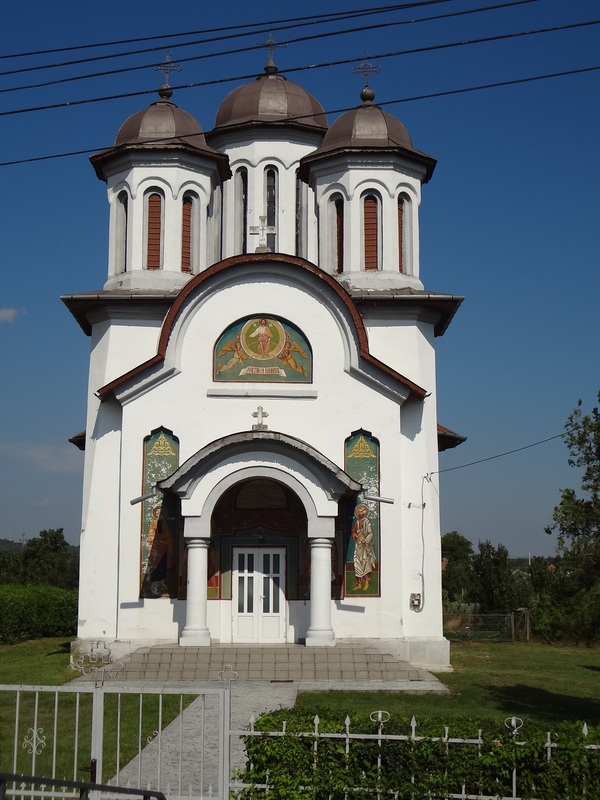 People in Romania just don’t have or use air conditioning and especially in a little remote church such as this one. The room that was the church was about 25’ x 25’ in size with a patio out in front of it. The Mandolin band had traveled with us to this service and set up outside on the patio. They were delayed in their playing a bit because of the humidity in the air that affected their strings. Two little girls who stood in front of us to sing touched me. The younger one in particular was exceptionally talented in her singing. Here they live in some remote forgotten village corner of the world, but yet they praise Him in their song. 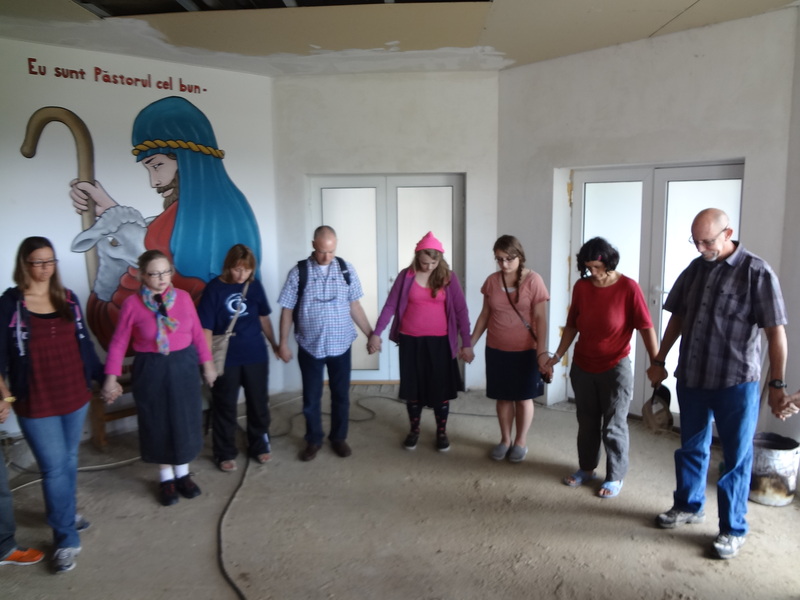 The ladies and men from the congregation did much like the other churches in praying, but they also stood and read a scripture or sang a song or read a poem or gave a testimony from their week. It was so moving even though we couldn’t understand them. The singing was beautiful and the idea that a precious village lady who didn’t know much about the outside world, knew enough to stand and read poetry about the Lord! It was convicting in the sense that we are, as Americans, emotionally handicapped in our praise, either leaning too heavy on feelings or not feeling at all. This was genuine praise stripped down and raw, and real. As I sat taking it all in, I was caught up in the whole environment. As 2nd man preached, he was accompanied by clucking and quacking and rooster crows, I was soaking, soaking, soaking it all in. A couple of hours later the services were all over. No, people in other countries aren’t necessarily better than us and I’m not trying to shame anyone. The truth is we do tend to get caught up in our soft living and mighty pride over here in America. But, I do believe that we can learn much from our brothers and sisters in Christ who have faced harder times than we. You see, while Romania was under communist rule until the late 80s people had no options of riding the fence in their Christianity. You were either in or out, the choice had to be made, for the risk was great. Risk breeds commitment and we just don’t face that here…yet. Oh I don’t want to face risk any more than the next person, but I do want to learn what I can from a people who have faced the risk and blessedly come through! 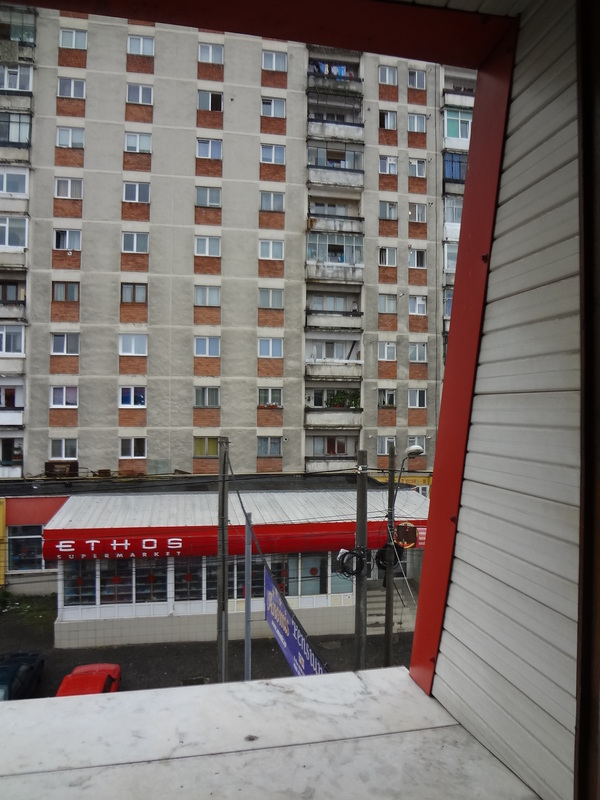 As we awakened to morning in Romania, we were greeted with the honking of cars down on the streets, a cool breeze from the open window and the neat realization that my hair appliances were not going to be working on this trip. Before you think I’m too much of a traveling rookie, I must say that I did try to prepare for this. I bought a converter and adapter before we even left the states. Then, just days before leaving I read the instructions only to be alerted to the fact that it was NOT to be used with hair appliances. Instead it was only good for small gadgets like cameras. Well my thought on this is phthttttttt! I don’t want to use my camera for pictures if I can’t do my hair! Hello! It’s not that I’m ultra vain, but I was born with naturally frizzy hair…and a lot of it. Not pretty curls, and not smooth and straight. It is the main reason, that I could never be on a reality show like Survivor, that and I get hangry if I don’t eat. They’d tell me to bring one thing I needed if stranded on an island and I’d be there with a straightener and no plug in sight. Anyway, my plan was to just buy one when we landed because we originally were going to go to a supermarket for supplies. However, with the flight fiascos, I thought I’d be smart and just buy one in the London airport while we were on our layover. Pretty smart huh? I’ll admit I was pretty pleased with myself for thinking ahead. Yet, to my chagrin, the plug for England doesn’t fit the receptacles in Romania, go figure. So, I spent the morning knocking on doors asking our group if they had anything with which I could do my hair. I did borrow a hair dryer from Tammy and Laura Kleinmann, and as I’m writing this I’m remembering that I need to go buy a new one for these ladies as I blew theirs up trying to use it with …you guessed it, my converter. On a deeper note, we made our first stop at an orphanage that Manna is now constructing. 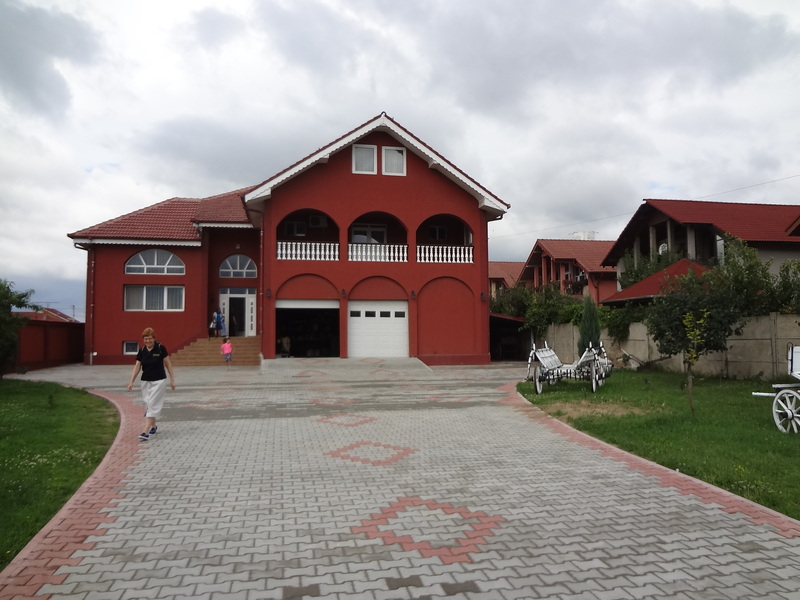 The construction and vision for it was originally that of a widow woman from the U.S. who had moved to Romania to start an orphanage. She had already helped start it before the building of this facility. Some, who are still in the care of the orphanage, are adults with special needs. She, unfortunately, ran into some health and then financial obstacles that prevented her from finishing the project, so she passed it along to Manna Worldwide. It is going to be an amazing facility when finished. Their model for orphanages is called Bridge to Life homes where they have a married couple raise the kids as their own in a family setting. This way it is not a dormitory, uncaring, or impersonal atmosphere, but rather a close knit family unit functioning with responsibilities and raising of kids in the nurture and admonition of the Lord. There will be enough space for four family units to live in this facility with quite a few kids per unit. My only regret is that we didn’t get to meet the young people who will initially get to live in this building due to time constraints and our late landing and altered schedule. Hearing the story behind the vision. 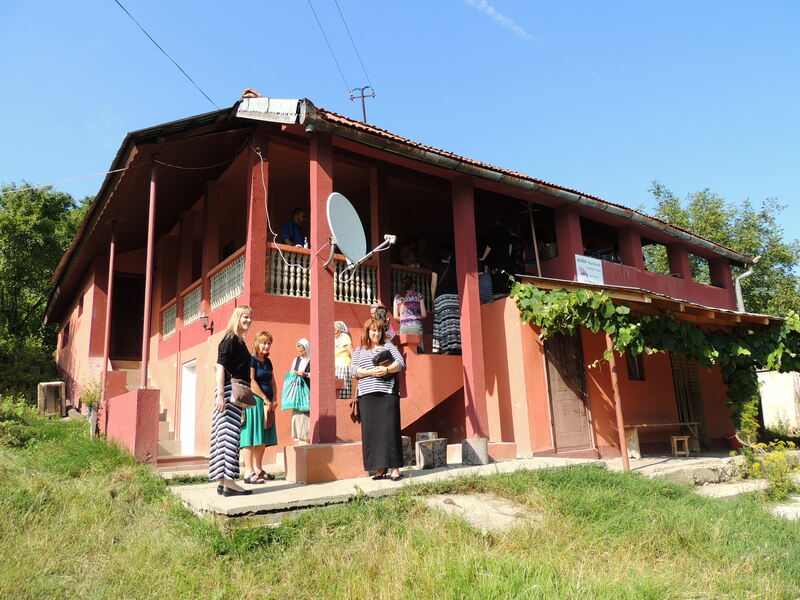 After touring the home we loaded back into the bus for a five-hour drive to Severin, the home of Pastor Rica and his family. Pastor Rica, we noticed was a passionate and thankful man. Just moments into meeting him I realized, “oh we’ve got a hugger here!” He hugged 2nd Man probably a dozen times before we even got to his home. He definitely knew how to make a group feel welcomed. 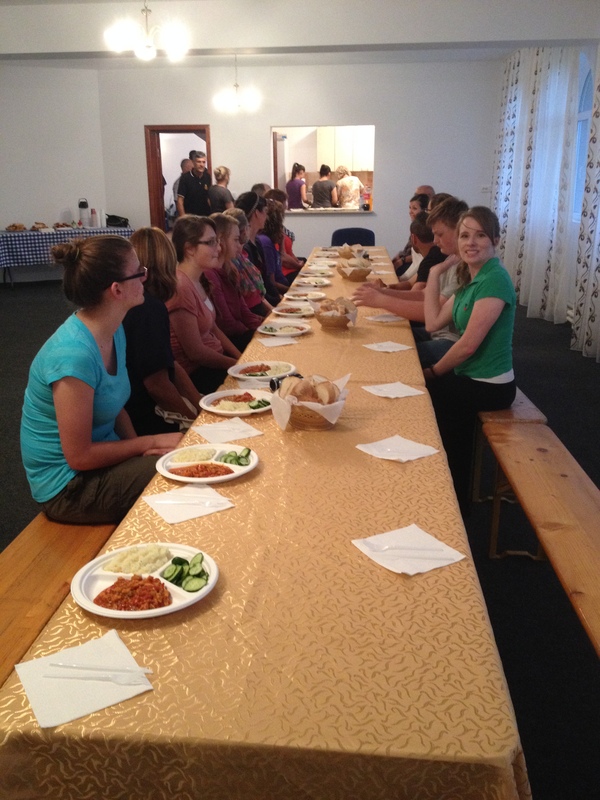 Upon arrival we were greeted at the church with a church tour and home cooked meal that was amazing! The church construction was only finished this past April of 2014. They had gotten the plans from our own church back in Ponca City, OK and adapted them to fit their needs. It was so warming to see this church with so many similarities to our own and know that we had gotten to be a part of the planning of this building. 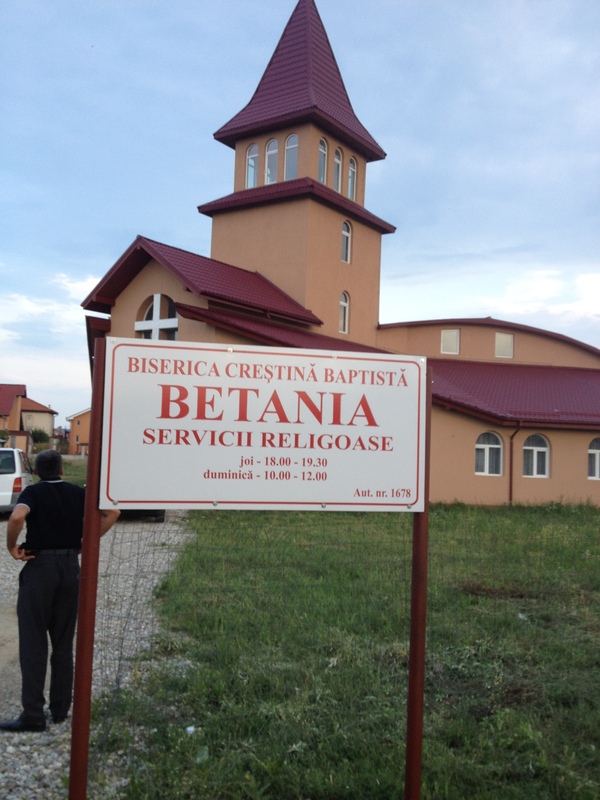 The new church in Severin! At dinner we were informed that our leader, Manna Director Jerry Abbott, as well as 2nd Man and myself would be staying at the home of the Gonciulea’s and the Ciupuligas. My initial thought was, “oh no!” I mean, it was kind and generous of them, but my private shy side sometimes gets panicked in these situations, as well as my private want-my-own-bathroom side. However, we were here to serve and I quickly dismissed my hesitations and decided to roll with it. Imagine my glee when we rolled up to their house to find a huge, western world style home that allowed 2nd Man and I to have our own basement suite complete with private bathroom! Now, let me give some background on how these missionaries were blessed with these accommodations. I assure you it is not because they’re just rolling in the dough. 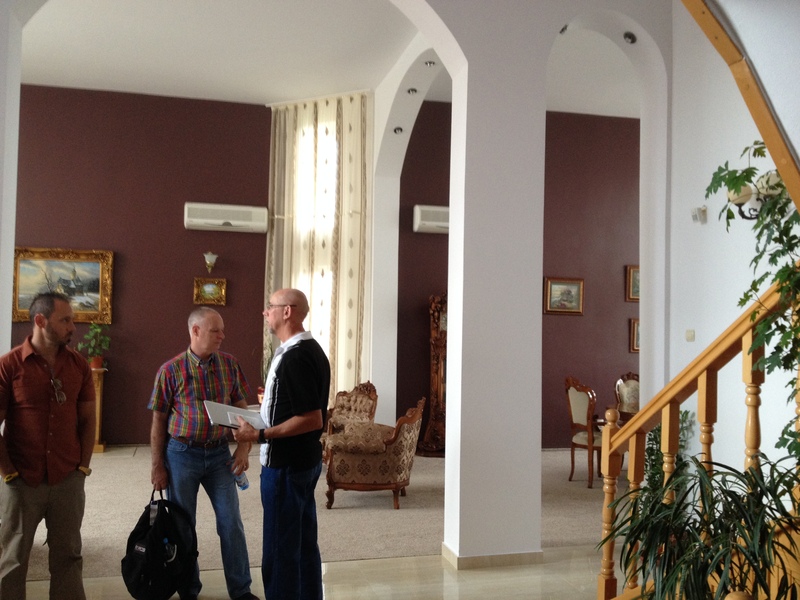 While they lived in the states they were blessed with a beautiful home and were able to bring over the plans to Romania when they moved back. Apparently the construction workers weren’t adept enough to do the English to metric conversions correctly and they ended up with a much larger house than the original plans called for. 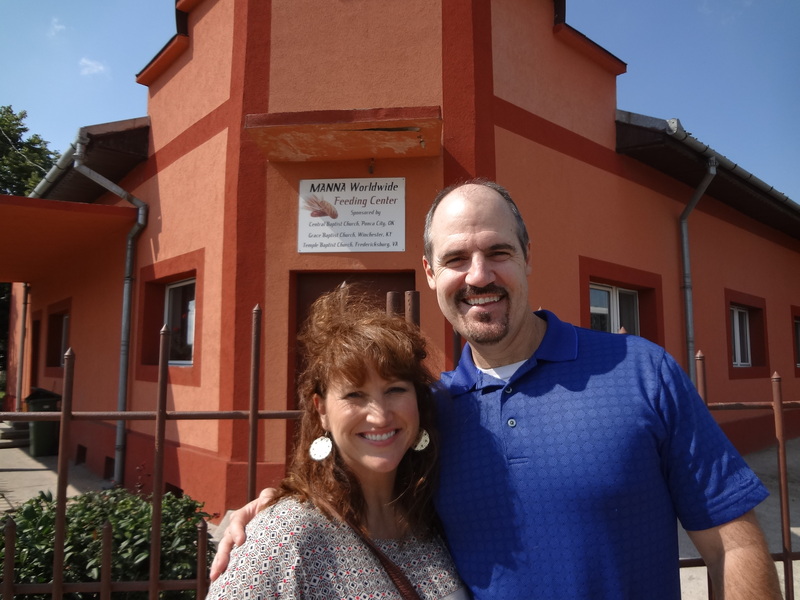 This worked greatly in their ministry’s favor for the first fourteen years of being back in Romania, as the church used the great room as their church sanctuary and the basement for children’s’ ministries. As a matter of fact, they had only just finished redecorating and getting their American furniture out of storage before we came. 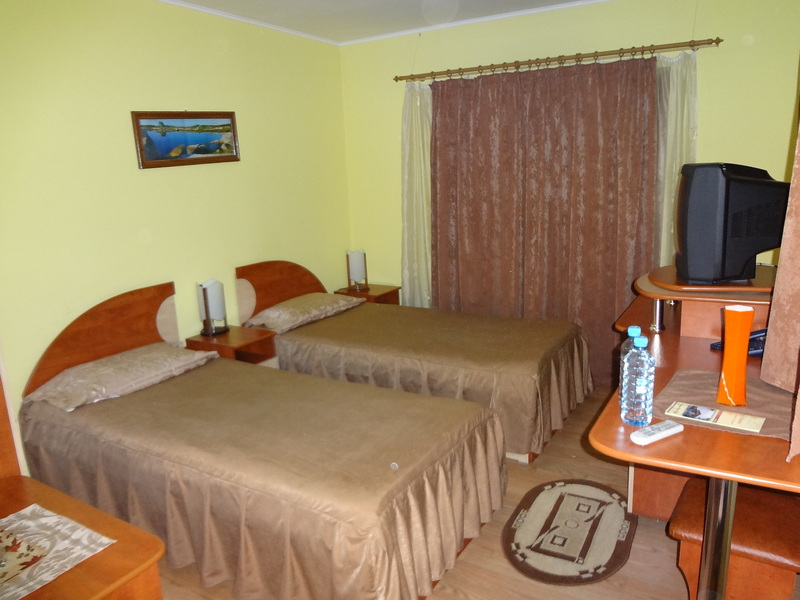 It is pretty expensive to even get an apartment in Severin, so their Son-in-law Sammy, daughter Becky, and grandson Sammy all live there comfortably as well. What a blessing! A view into the great room that formerly served as the church sanctuary. They were such hospitable people too. We were treated so well and enjoyed some wonderful conversation. I likened it to staying at the home of Jesus. I actually felt kind of guilty though in that we weren’t exactly suffering for the cause if ya know what I mean, that and the rest of our group was staying at the local hotel. I was later relieved to know that the hotel was quite nice and comfortable for them. They came over in the mornings on the bus after breakfast to meet up with us and go out for the day. But, best of all (well ok best is an exaggeration but roll with it) they had a hair straightener and blow dryer I could borrow! Yea me! The Hotel Flora where our group stayed. We enjoyed a wonderful breakfast every morning with eggs, and cheeses, salami and home jarred current and sour cherry jams on fresh bread bought daily. I was sure I would not go home hungry. Pastor Rica enjoys gardening. That sounds like a pretty generic sentence in context with the degree to which he actually enjoys it. 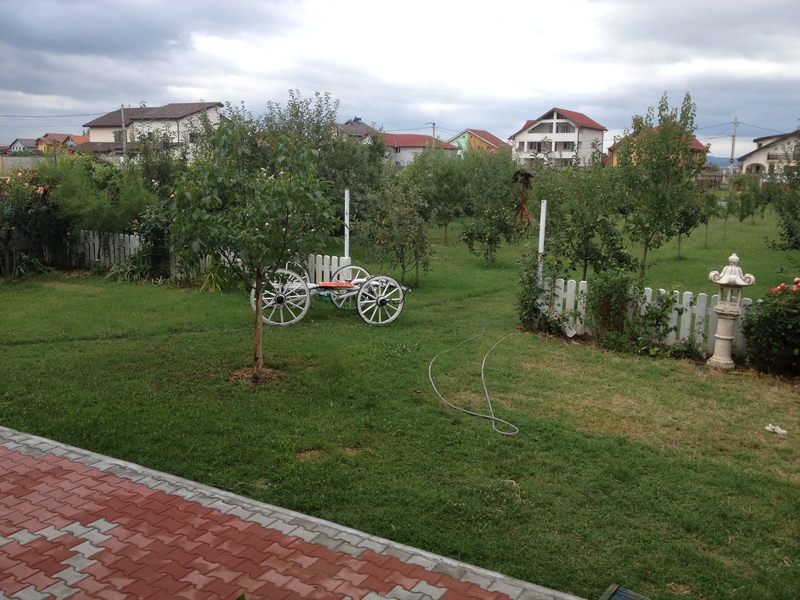 Though they are in the city limits they have an entire orchard in their backyard with plum, apricot, cherry, and peach trees. Along with a garden full of tomatoes, eggplant, blackberries, raspberries and a farmers market full of other things. We were privileged to eat of his harvest and it was fabulous! 2nd man and I strolled through the garden one evening with Pastor Rica as he kept shoving berries into our hands. I would just get my mouth wiped and here came more! Gotta love a man who keeps shoving sugar in your grip right? Truly God has blessed this family for their great sacrifices. I don’t dare presume that it isn’t without it difficulties. They, however, don’t choose to share those readily and those of which I am aware aren’t mine to share. But, suffice it to say, we were humbled and honored to share their home and company for the short time we were there. 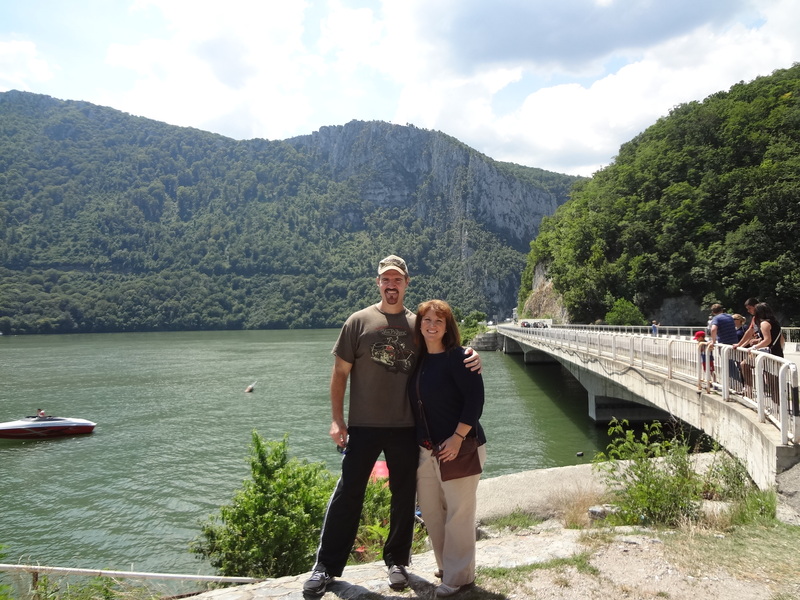 We took a little jaunt over the pond to Romania this summer. 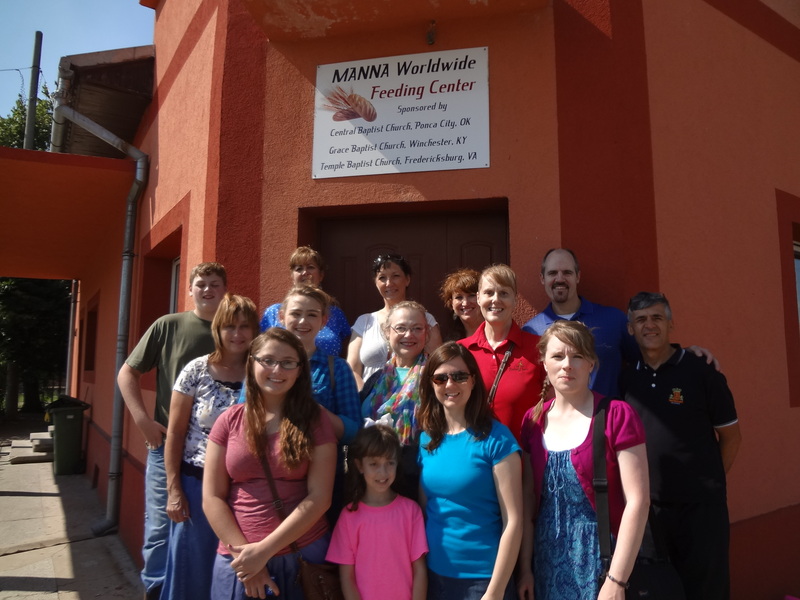 It was a mission’s trip for our church to visit a feeding center we sponsor via Manna Worldwide I say it all casually, but truly it was the first time I had technically been out of the country and I was excited out of my socks! When Pastor told 2nd Man he would be heading up the trip and I could go along, I was thrilled and honored. One of my biggest joys is to see things I’ve never seen before. One of my other joys is reading biographies. In the past several years I had read the biography of Richard Wurmbrandt who started an organization called Voice of the Martyrs and others like him. He told of his time imprisoned in Romania under communist rule and his escape from the country after his release. It struck a curiosity in me as to what life must have been like behind the iron curtain (and still is like in some parts of the world). 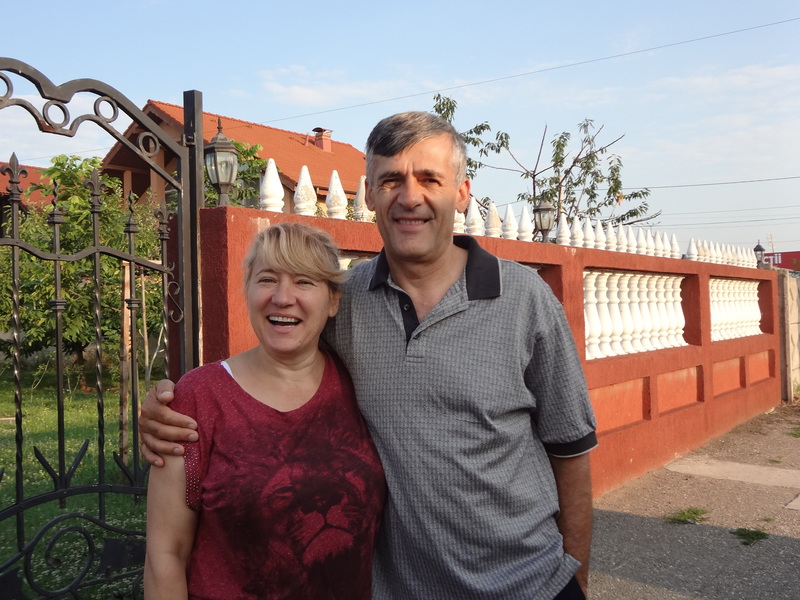 The missionary we were visiting, Rica Sever Gonciulea and his wife Cathy had a similar story in their escape across the Danube River into Serbia, and making their way to the United States. They didn’t get to see their children for three years, before they could get them over to the states as well! You can see The Gonciulea’s story here. However, what is even more impressive is that they don’t just readily offer up this information about themselves, but live for now and the future in winning souls to Christ, feeding and teaching underprivileged children and helping get orphaned children off of the streets. They are so humble in fact, it is a bit intimidating to be in their presence. Serving alongside their daughter and son-in-law the Ciupuligas they are a worthy foe for the enemy. We showed up at the church on time and all was looking pretty clear for our departure. Everyone was in good spirits and seemed rested up and ready. Our motley troupe of travelers consisted of; 2nd man and myself; one of the secretaries, Miss Lynne; a mother and teen daughter duo, Tammy and Laura; another mom and her two teens Cynthia, Carissa and Karston; a couple of other ladies, Judy and Suzette; a single lady from a sister church in town, Michelle; and another mom and her 8 year old daughter, Connie and Kyleigh. If you were able to follow, that was 10 women, a little girl, a teen boy, and 2nd man. Pretty heavy on the estrogen this group was. 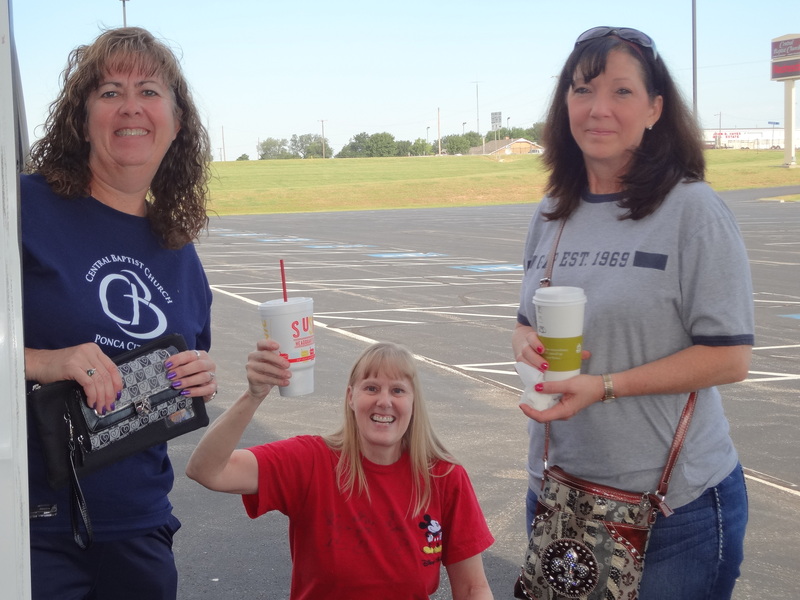 Our Three Amigos: Judy, Lynne and Suzette caffeinated and ready to travel! I’ll take this moment to put in a disclaimer that I truly do love everyone that went on this trip. They are my brothers and sisters in Christ and I’d never want to displease Him or hurt them. Any views of frustration or annoyance are meant in good humor and this is my story. I’m very sure I was the source of frustration to others as well, but they can write that story. 2nd man had tried to prepare us all ahead of time, knowing that large groups of women, with little male presence, could sometimes boil into trouble. Mix that with at least four (maybe 5) of which are strong choleric personalities. No offense to the cholerics out there, just a fact that it’s a strong personality type. Then mix that with us melancholies on the trip…well let’s just say that the word for this trip was FLEXIBILITY. However, his reminders to “die to self” and be flexible were well taken and well applied, as we soon would find out. I had suggested that we get shirts that said “It’s a good day to die!…to self” but we decided that was probably not a good idea when traveling through security at the airports. When we arrived at the airport our little motto of flexibility was instantly put into high gear. We were supposed to be allowed to have two checked bags each since we were a humanitarian group taking shoes and other activities to children overseas. Well, the first airline that we checked in with didn’t get that memo and we ended up paying $1200.00 to get those shoes and bags over there! 2nd man did a primo job at assuaging the initial frustrations and working with the airlines to sort it out. Then, while checking in our bags one in our troupe had packed everything including a kitchen sink I think, so we had to disperse some of her belongings throughout everyone else’s. It was an eye rolling moment that we soon found out would be the least of our worries. We got through security rather well and were on our way to the gate where we were welcomed with the news that our flight was cancelled! Not delayed, but all out cancelled. As we stood in line to get our schedules rearranged the airline attendant announced that we could call an 800 number to talk to someone directly with the airline that could help us. Since we had a large group we initially thought this was a good idea. Immediately one of the ladies started dialing right alongside of 2nd man. Now this was amusing to me since 2nd man was the leader. I wasn’t sure what she was thinking, so I tried to politely say aloud to 2nd man “don’t you think we should only have one person calling? That way we won’t be doing any double booking?” She didn’t take the hint. Finally, 2nd man realized that she had the need to make this call so he conceded and let her talk to the person on the line since she got through a little faster than he. However, this proved futile as the airline worker had to make different flight arrangements for each person in our group individually. They had, at one point, our resident 8 year old, flying separately from her mom! I was a little appalled and would like to take this moment to suggest to American Airlines that they get a better “group travel” reservation set up. 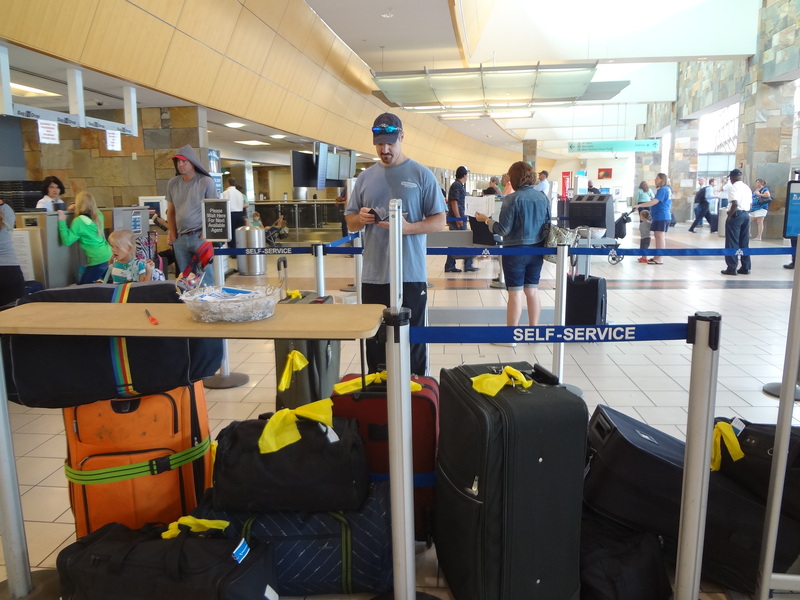 After going through all of this rigmarole, we had to rebook everything one at a time AGAIN with the airline worker on site, so the whole phone call thing was in vain anyway. After 7 hours of this nonsense everyone was on his or her way to Chicago. We were split up onto two different flights, but we were on our way. We were actually excited though, because it looked like we would get a 7-hour layover in London and maybe go see some sights. However, that dream was crushed when we arrived in Chicago, ran through the airport (which is quite large I might add) only to find out that our flight to London was now delayed as well. Boo! I had a glimmer of hope that maybe the two ladies that had been separated from us could now get on board the same flight to London, but that would not happen either, so we all hurried up to sit down again until the flight left. A little side note on international flying in coach class if you’ve never done it: For some inhumane reason, the airlines walk you through the first and business class sections of “spread out and prepare to be pampered” before sitting you back in the cattle car area of the plane. This is cruel and unusual punishment for the middle class person in my opinion. Keep in mind I’m only 5’2”. 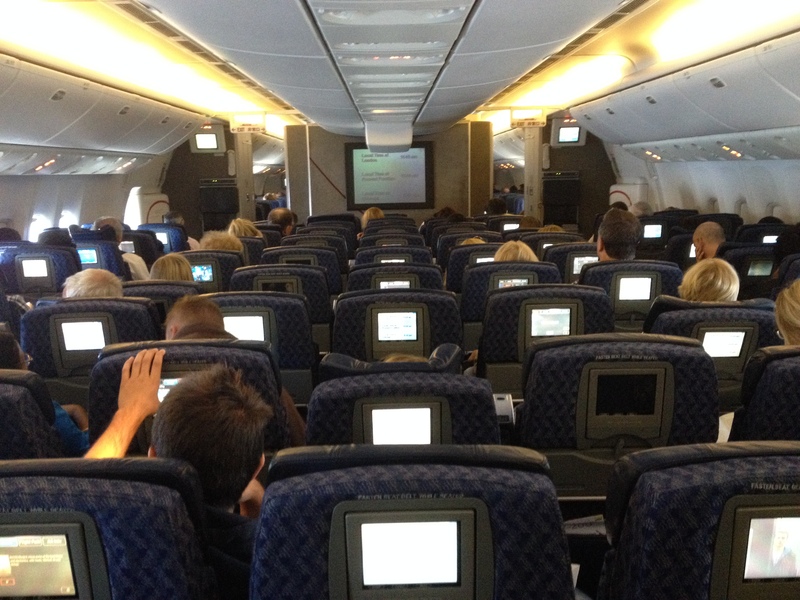 However, I was in the middle of the middle section of the plane and thought I was gonna crawl out of my skin. 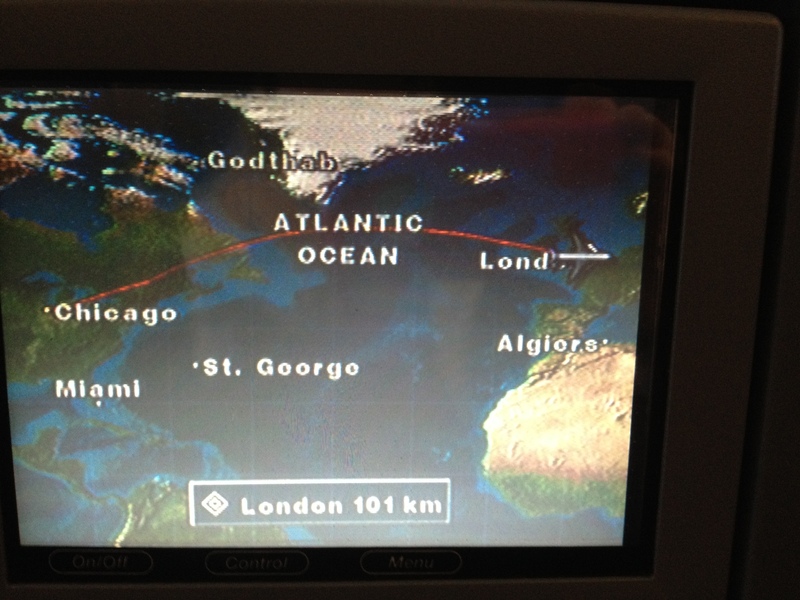 There was no seeing Greenland, or Ireland as we flew over. There was no getting up and walking around the cabin because everyone around me was asleep! Only one other time have I felt claustrophobic and that was in a cave deep in the earth, but I digress. 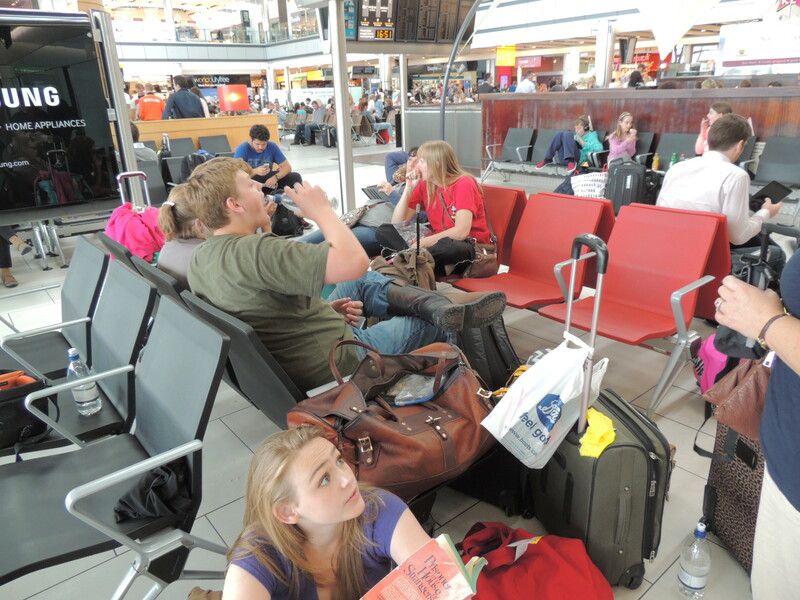 We did get the privilege of having a layover in London’s Heathrow Airport. It is known as the largest airport in the world. Of course the layover wasn’t long enough to go have tea with Princess Kate, but we at least had time to do some fabulous people watching and a little shopping too. You know, to buy stuff in a gift shop that has places you didn’t actually get to go see. There were people from every nationality on the globe at this airport. Security was filled with a mass of humanity. There were as many security lines as there are cash registers at Wal-Mart. With the difference being that all the lines were open! They were busy and thorough. A couple of our group got the full pat down privilege and a full check of carry on luggage items with some confiscations to follow. This was just kind of humorous to me, but I’m sure they didn’t like it. After getting everyone through the corral we were able to find a spot to impose squatters rights and made a home base. From there we chose to rest, text or shop for the next five hours. Finally, our flight to Bucharest, Romania was at hand and our group was all together! As we got closer to our gate filled with passengers who were mostly Romanian themselves, the language barrier started to take affect. In fact, the woman I sat next to didn’t know a lick of English. Well, that or she just didn’t want to talk to me (which is quite possibly true). Anyway, cultural reality started to set in and we were on our way. This flight was, thankfully uneventful, but late late late. We landed in Bucharest around…well…sometime around dark thirty. We met up with others who would be part of our group for the next 6 or 7 days; three people from Manna, Jerry, Curt and Beverly; A couple from Albuquerque NM, Sarah and JJ; and a college student from Arkansas, Courtney. 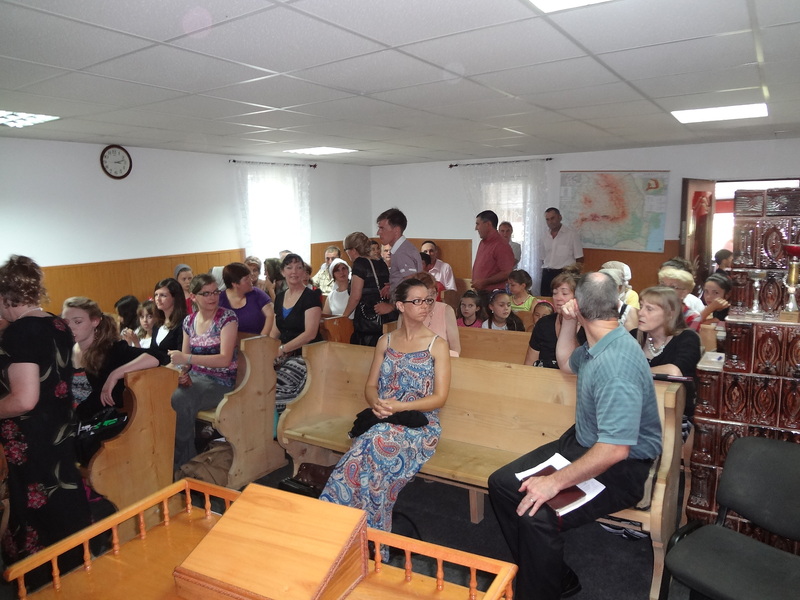 Our missionary, Pastor Gonciulea, was also with the group. What I had missed in the memo was that we still had a three or four hour bus ride through remote villages to the city where we would stay for the night! We finally made it to our first destination and got into a small twin sized bed around 4:30 am. Ahh sweet rest! Mom vs. Mom: The War I Didn't See Coming. I just read this article via a friend’s facebook page and thought it was really worthwhile. Oh the comparison game…sigh. Anyway, it’s well worth your while to click on and read. The blog is titled Loving My Lot and she has some other really good posts too!